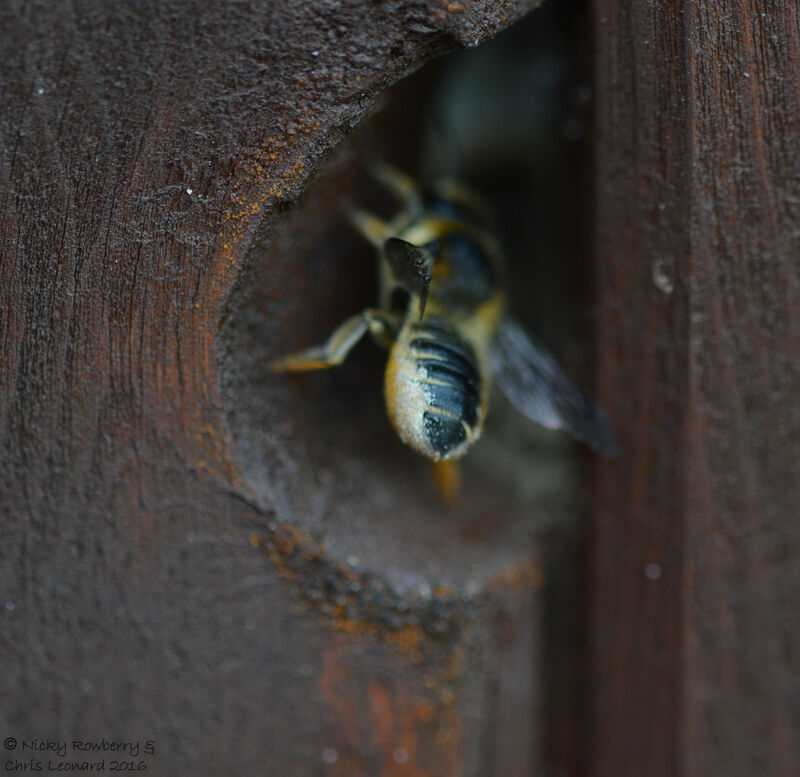 It’s taken me over a week to write this latest post, partly because I’ve kept getting side-tracked by things in the garden and partly because we’ve had friends staying – so I had to spend time tidying the house (although I doubt they could tell that) and drinking Prosecco! 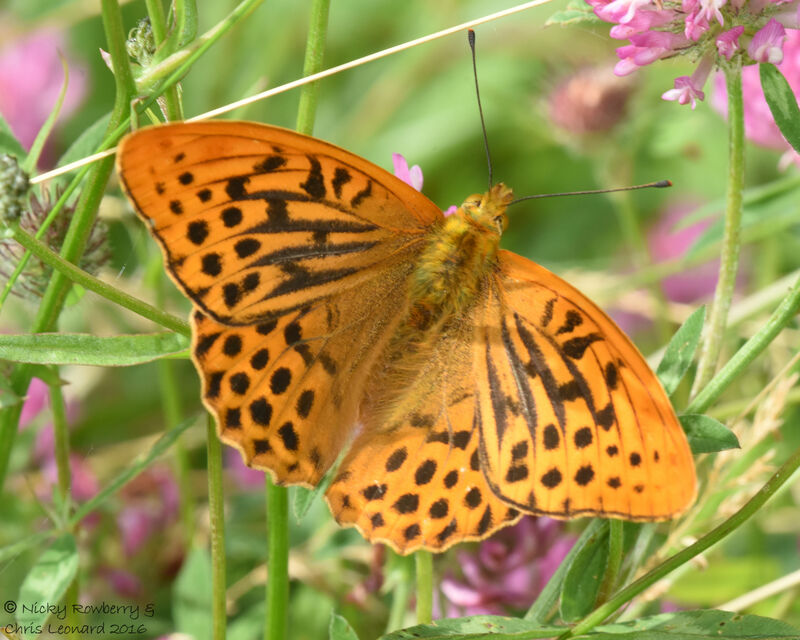 But over a week ago now, Chris and I headed down to Prestbury Hill, near Cheltenham in search of the Chalkhill Blue and Dark Green Fritillary butterflies. 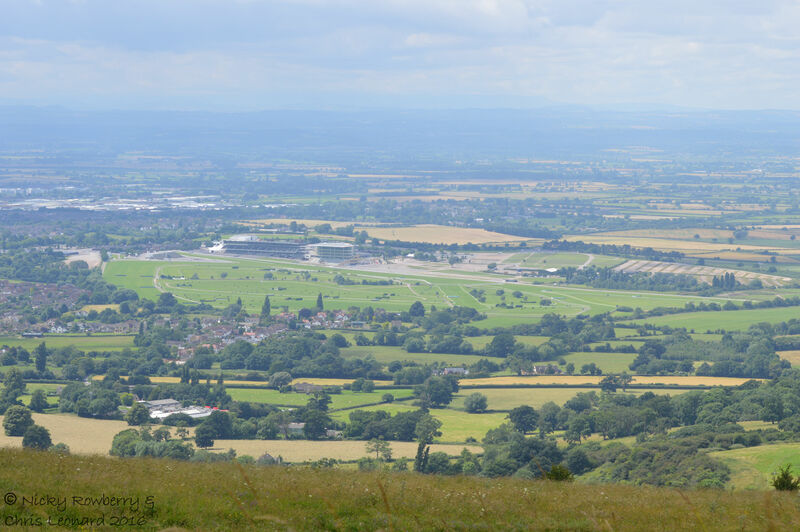 Prestbury Hill is, as its name suggests, high up, with stunning views over Cheltenham racecourse. 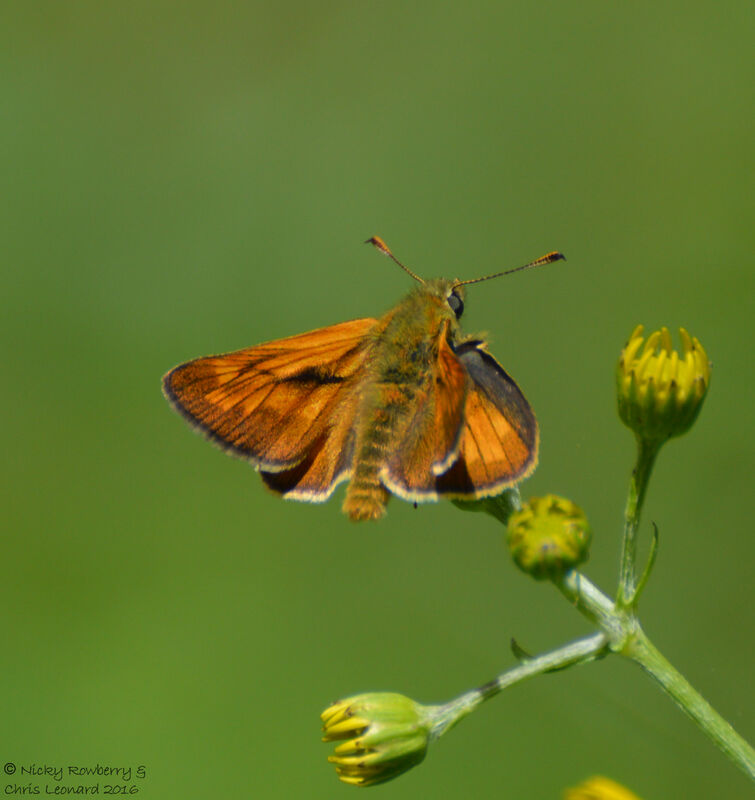 The reserve is run by Butterfly Conservation and consists of 2 areas of limestone grassland. 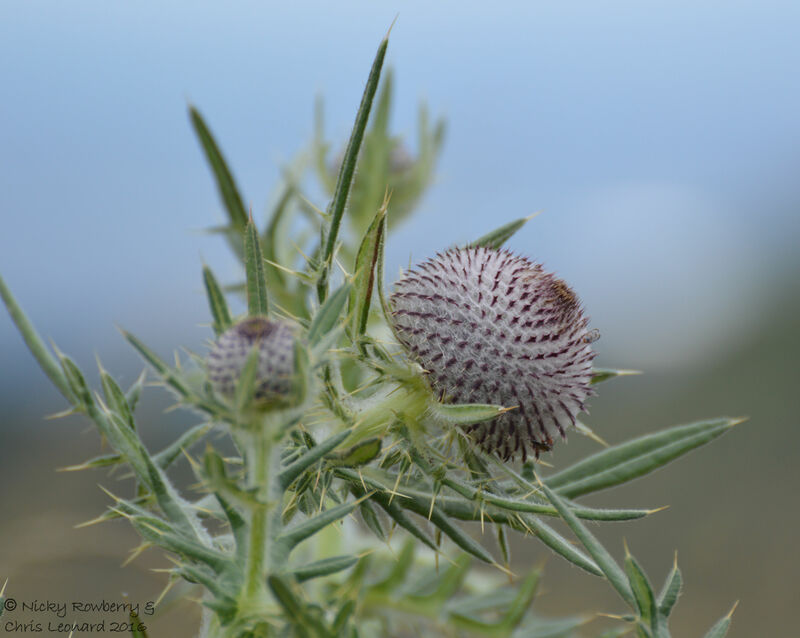 The sloping grasslands are full of wildflowers and insects and would be a lovely place to walk even if you weren’t into butterflies. 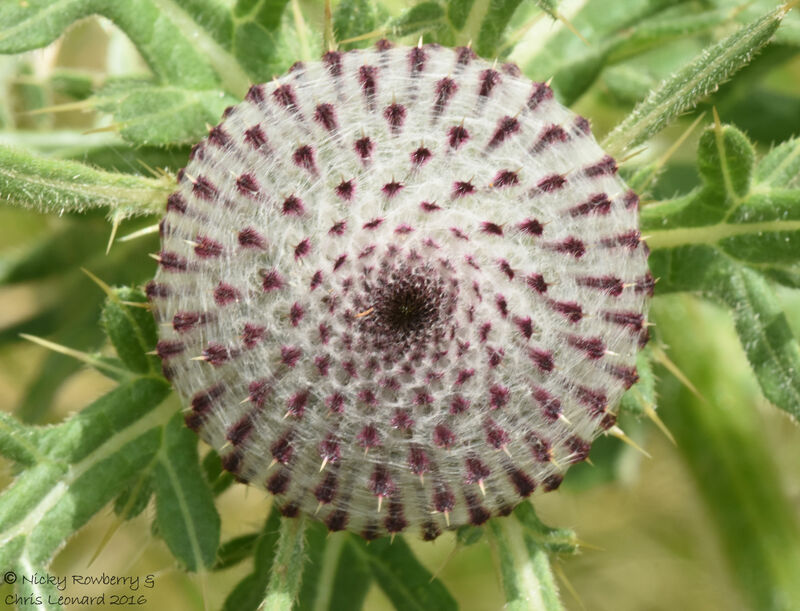 I particularly liked these Cotton Thistles, with their huge spiralling flower heads. 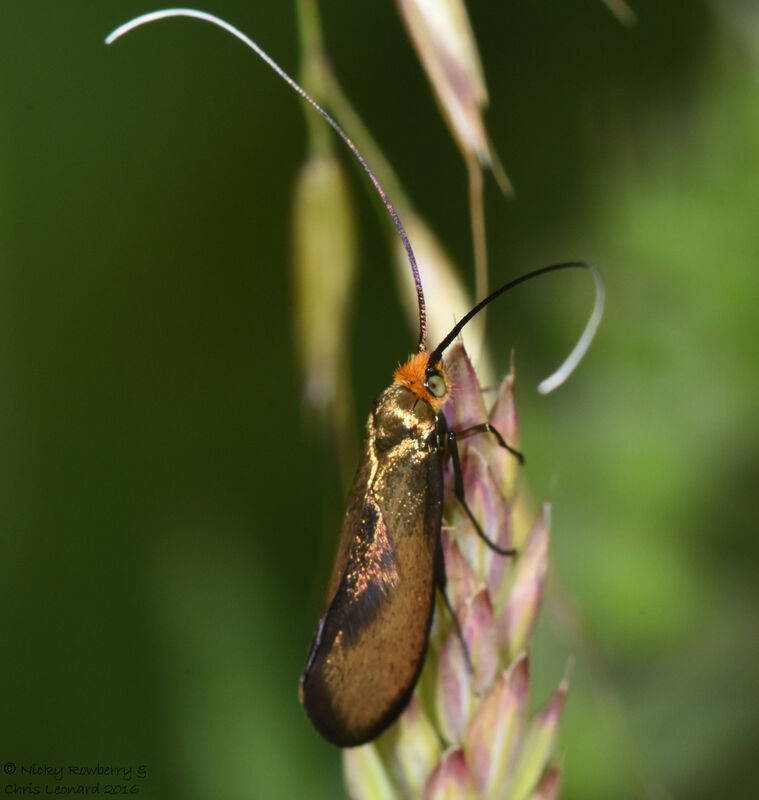 Although we went looking for butterflies, the first insect of interest we spotted was this beautiful Brassy Longhorn moth – I’ve no idea how they manage to fly with such long antennae? 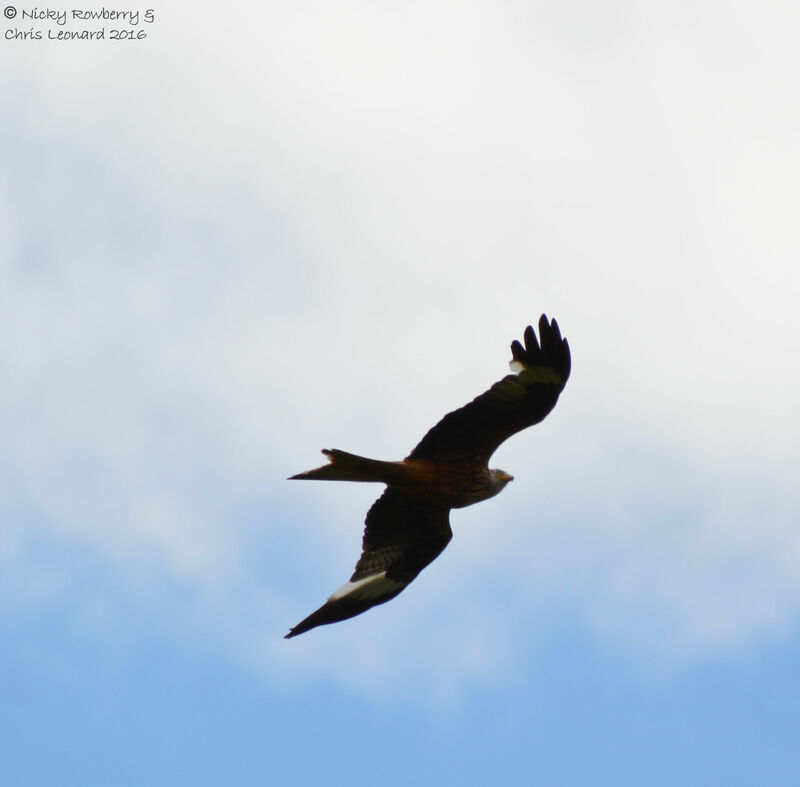 Although on these walks we tend to be looking down, or at least across for butterflies, Chris did look up long enough to spot this Red Kite soaring above us. Not a great photo as it was difficult to do against the bright sky. There were buzzards too, but as we see those fairly regularly at home, the kite got all the attention. 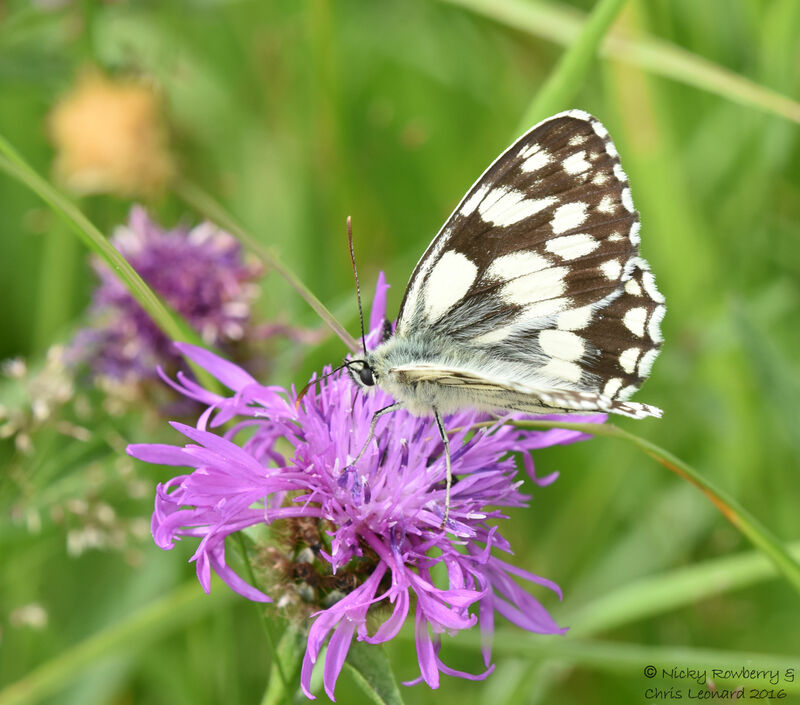 We followed the paths for quite a while, spotting lots of Marbled Whites and Large Skippers, while we searched for the blues and fritillaries. 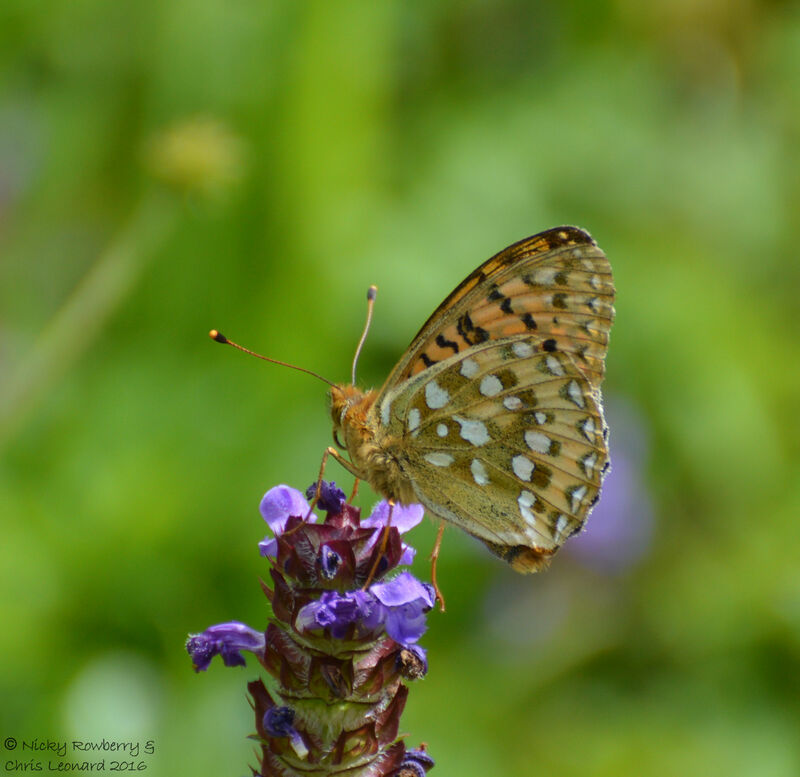 Eventually though we found the first prize of the day – a Dark Green Fritillary. It then took about 20 minutes of chasing about to get a photo to confirm that it was indeed our target photo. And then longer still to get another photo of it with its wings open, but it was well worth the hunt as it is a gorgeous butterfly. 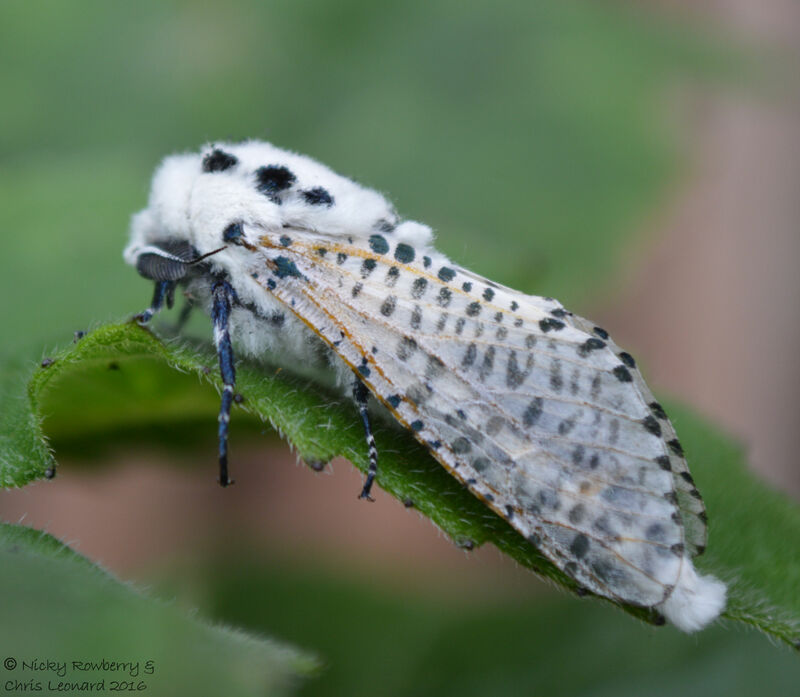 The reserve is divided into 2 sections, so having “bagged” our fritillary we headed over to the other half to look for the Chalkhill Blues. Turns out though our researcher (i.e. me) had got a bit ahead of herself as we were apparently a couple of weeks too early for these. 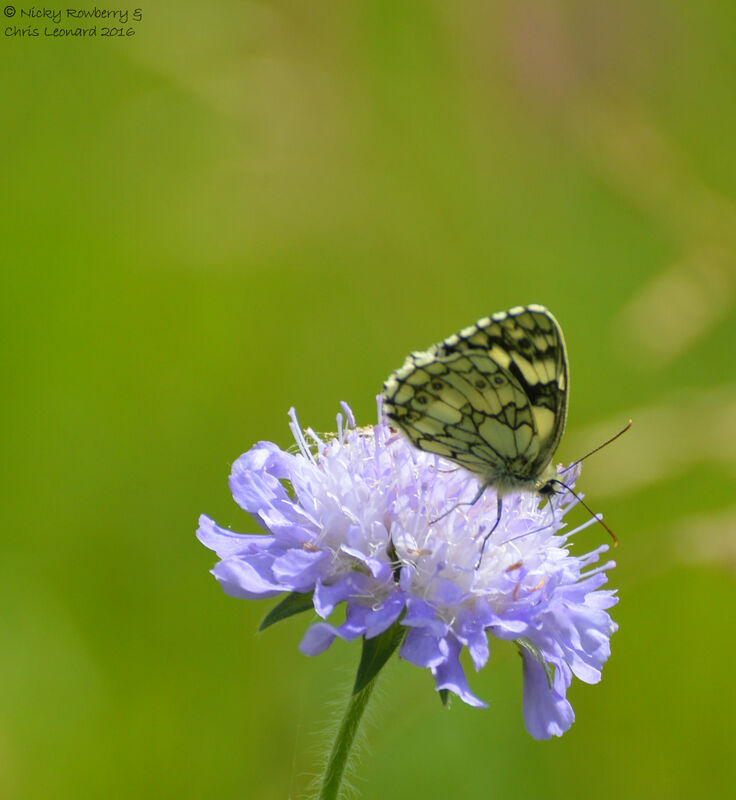 Fortunately we met some butterfly enthusiasts who put us right before we spent hours pointlessly searching for them. We did see some more fritillaries though, which we initially assumed were more of the Dark Green ones. 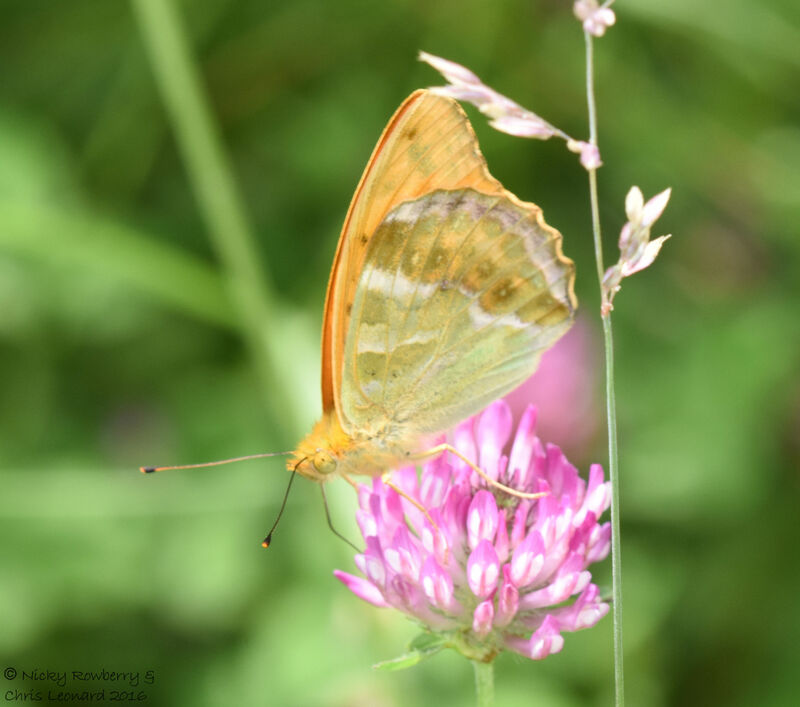 It was only when we got back and downloaded the photos, that we realised these ones were actually Silver Washed Fritillaries. They look very similar when they’re flying around. 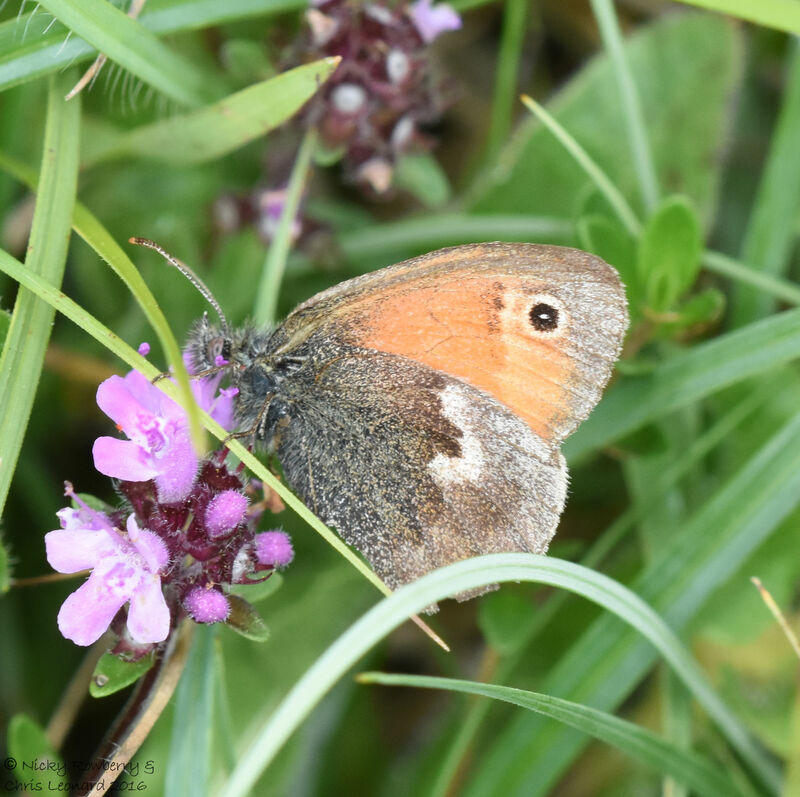 One final treat was finding several Small Heath butterflies. 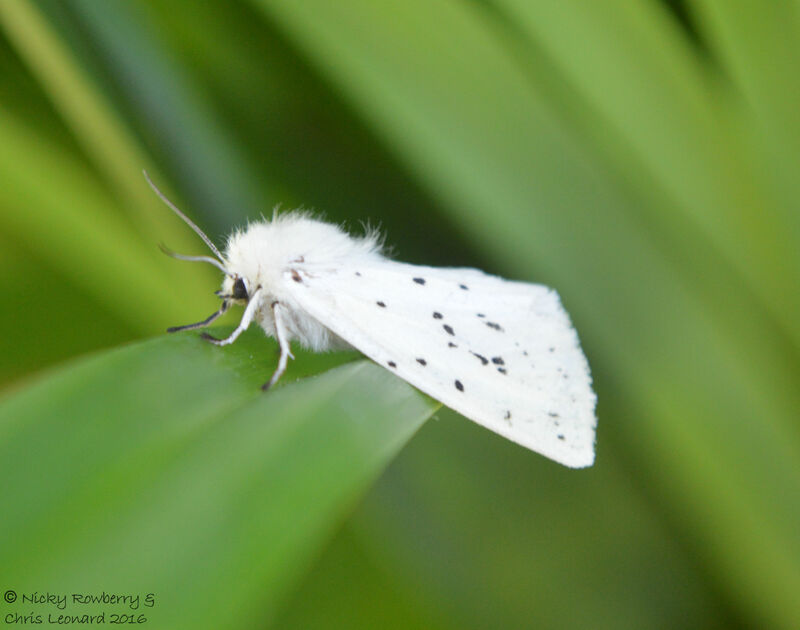 This had been a new species for us a few weeks ago and now they’re popping up everywhere! 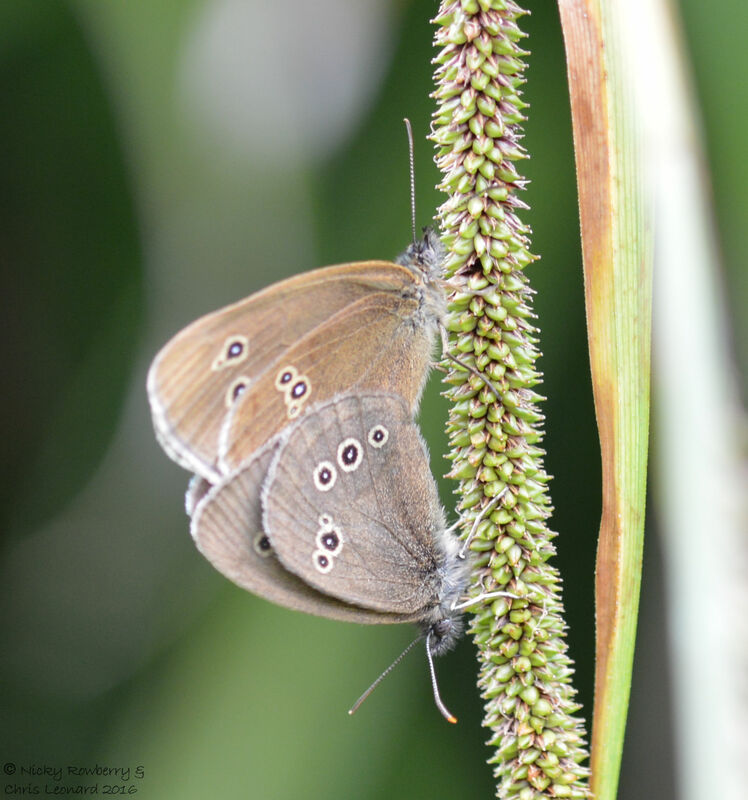 So another great day out and another butterfly species ticked off the list. 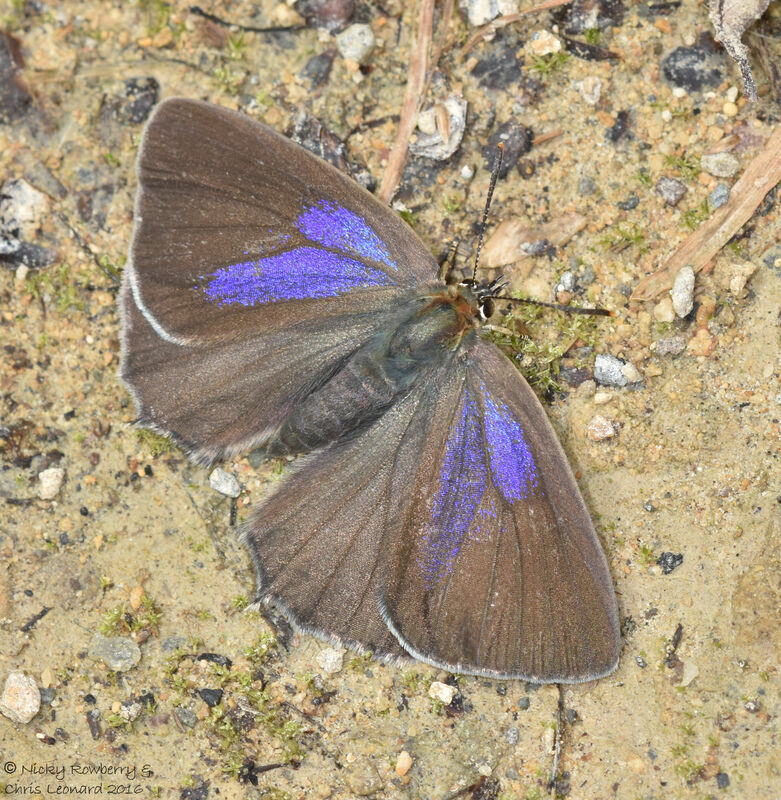 We will hopefully make it back to Prestbury sometime soon to see the Chalkhill Blues – so watch this space! Just a quick update on our garden hedgehogs. 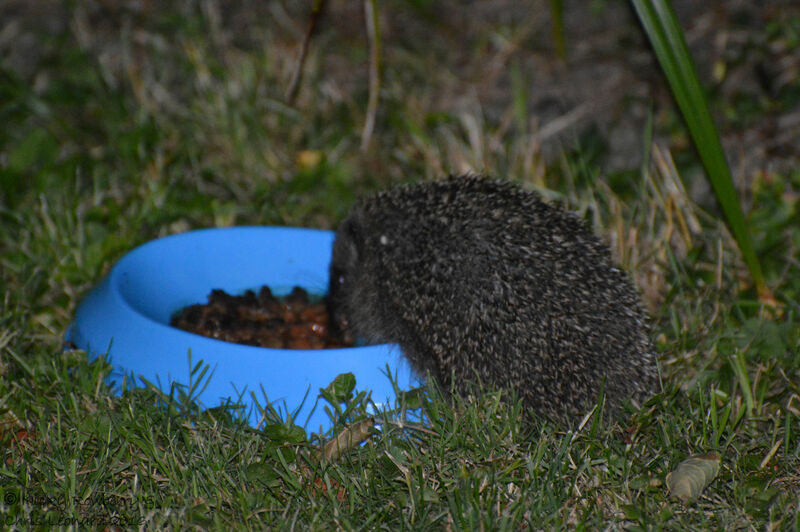 The good news is that we spotted 2 healthy looking adult hedgehogs in the garden last night as it was getting dark. One was more adventurous and came out for a bowl of catfood, the other stayed in the bushes waiting for us to go away. 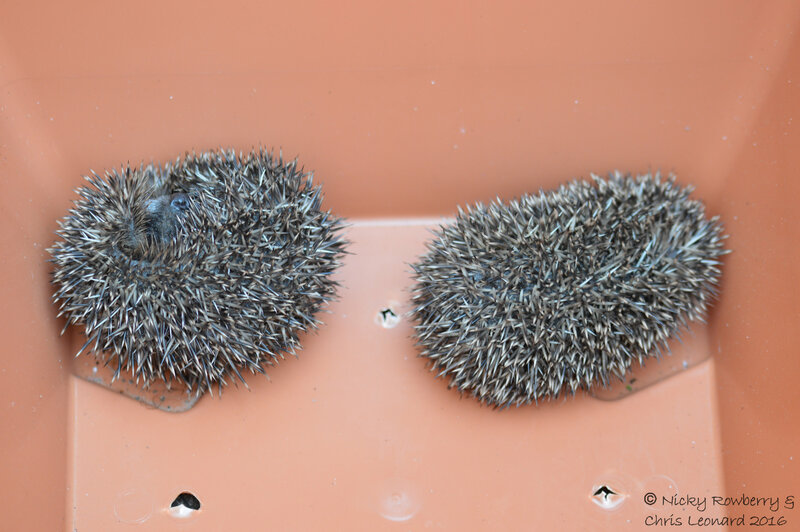 Whilst it was great to see that we still had our adult hedgehogs, I was then worried that perhaps I’d unnecessarily removed the 2 babies I found on the hot lawn earlier in the week. Of course there is no guarantee that the 2 adults we saw last night were the parents. I contacted the hedgehog rescue lady who reassured me that we’d done the right thing removing the babies from the heat as they could have become dehydrated, got fly strike, or even been predated. They certainly shouldn’t have been out by themselves in the middle of the hot afternoon. Better to have taken them to safety than take any chances. She also assured me that the babies were doing well. 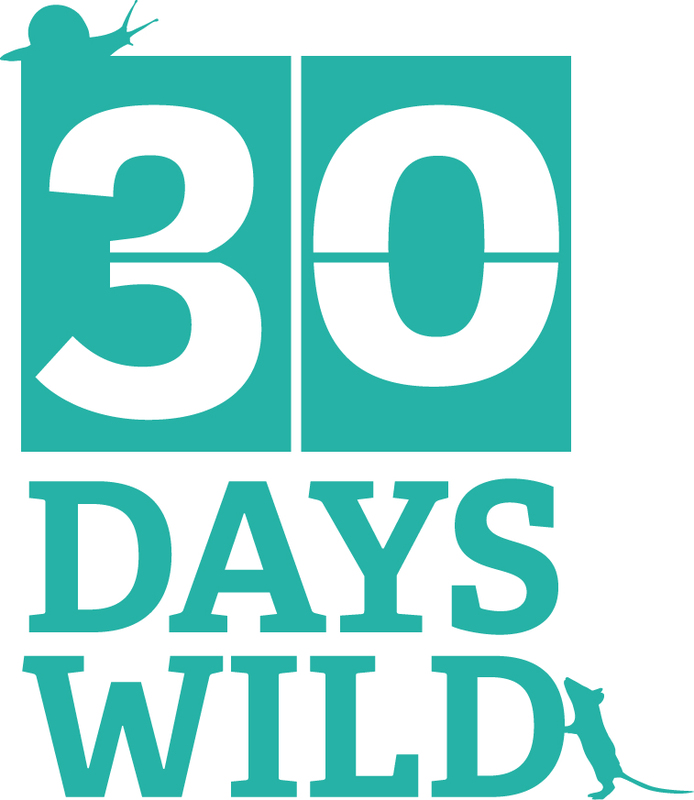 I’ll probably put the trail camera out over the weekend and hope we get some better footage of our hedgehog friends, so perhaps more updates next week. It’s boiling in Malvern today as it is around much of the country. Fortunately I managed to escape work early and got home mid afternoon. 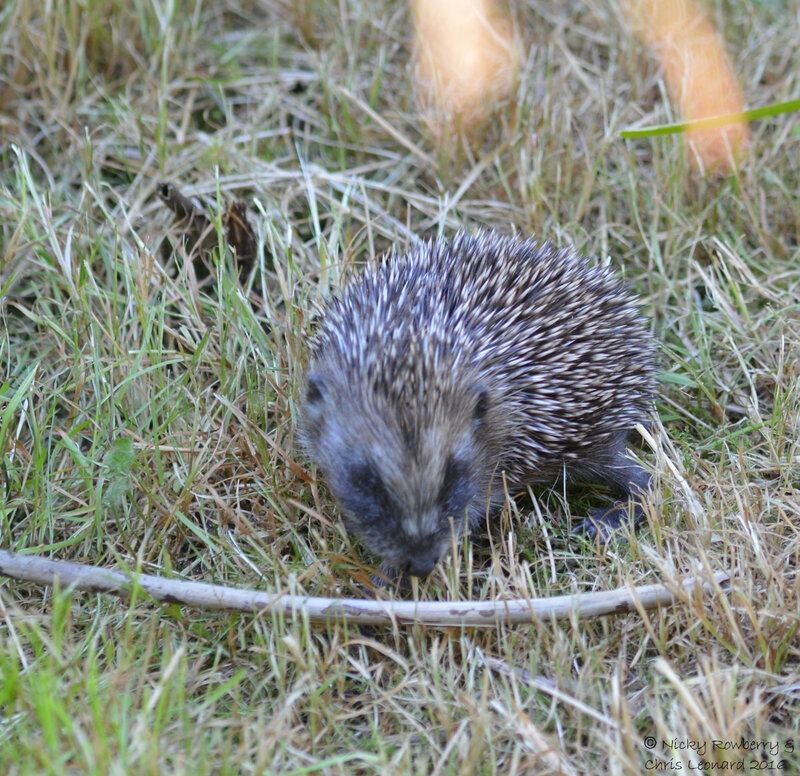 And it was really lucky I did – I went out into the garden to find two baby hedgehogs sitting out in the heat on the lawn. They were so small and although one was snuffling about the other wasn’t very lively – no wonder as the thermometer was saying 37°C! Fortunately the rescue lady was just around the corner so I took the babies down there straightaway. She weighed them – 82 and 90g, a male and a female – and estimated they were about 3 and a half weeks old as their teeth were just coming through. They were apparently in reasonable health and not dehydrated so she said the chances of them surviving were good. Whilst I am relieved to hear these babies will probably make it, it is very sad to think that it probably means the mother is dead. We have been watching hedgehogs in the garden over the last few months and it’s really upsetting to think one of them may have died. Thank goodness I didn’t get home any later from work to find 2 dead baby hedgehogs in the heat on the lawn. The lady at the rescue centre has taken my details and says when they are grown enough to survive we can have 2 back. She will apparently give us one of our original ones plus a different one (to avoid inbreeding between brother and sister). So at least that will hopefully be a happy ending. Hopefully I can give an update later in the year. If anyone find a hedgehog in need of help in Malvern the rescue centre details can be found at http://www.malvernhedgehogrescue.co.uk/ It is run on a completely voluntary basis and relies on donations, so if anyone can help towards her running costs, please donate – either as a direct donation or by donating foods, cleaning materials etc. 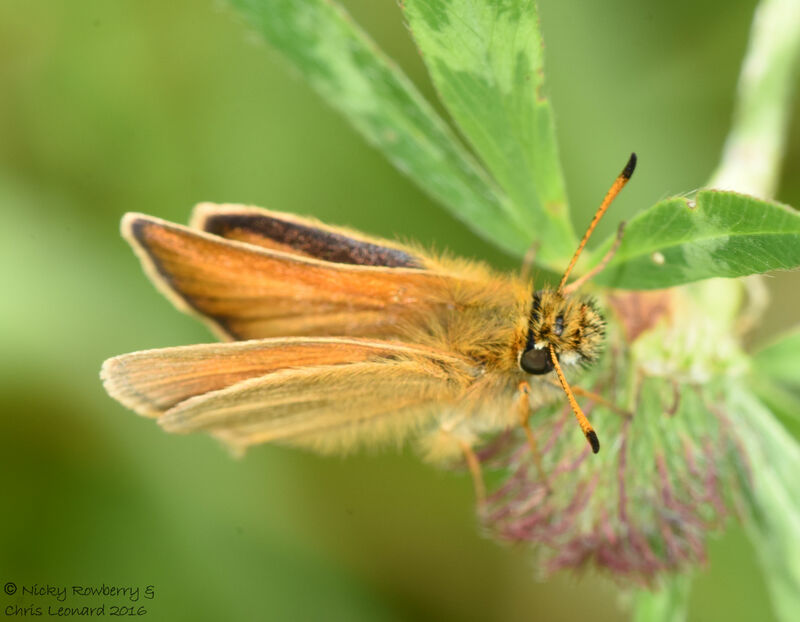 Today we decided to explore our local patch – so often it’s your local stuff that you ignore, thinking somehow that the grass is always greener (or the wildlife more exciting) elsewhere. 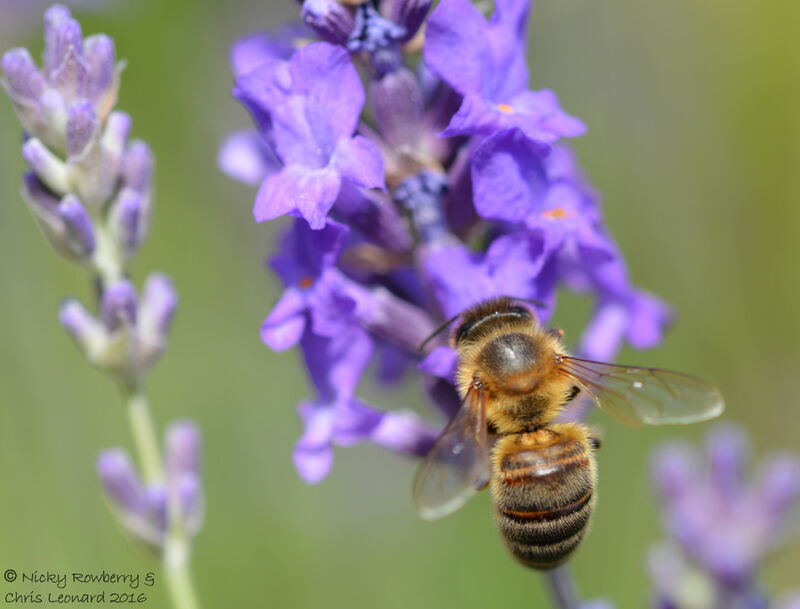 But the Malvern Hills are not only beautiful, but a fantastic location for wildlife. We forget sometimes how lucky we are to live here. 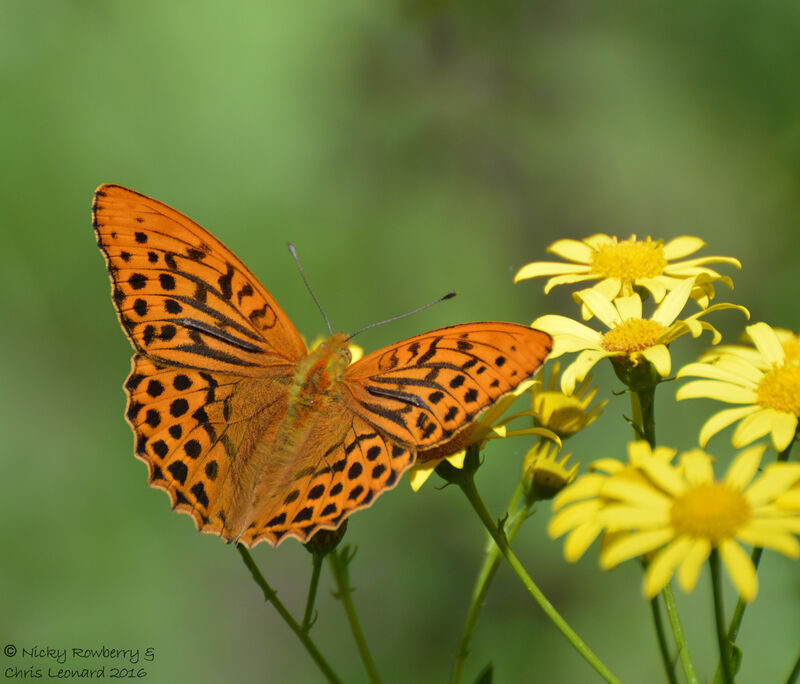 We’ve been concentrating a bit lately on “bagging” some new butterfly species and had so far added 5 this year to our lifetime list. 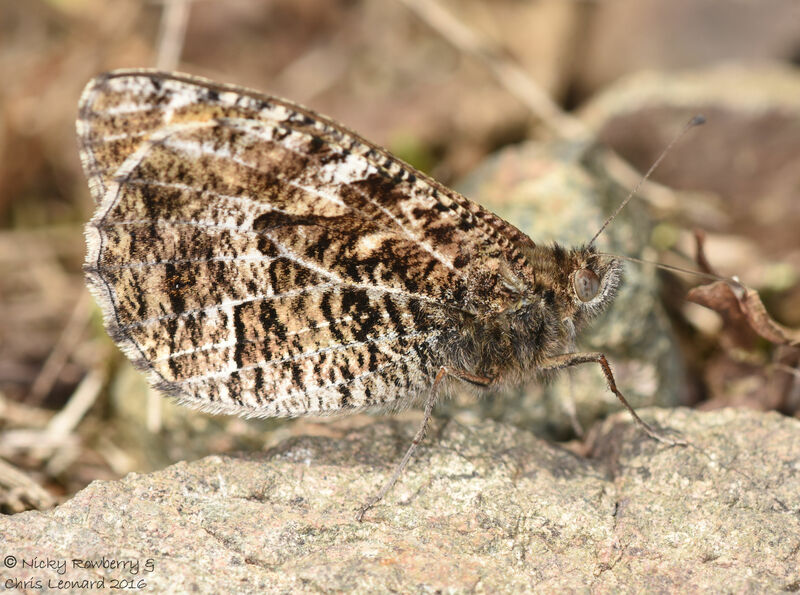 But there is one species we’d never seen that has a colony almost literally on our doorstep – the Grayling butterfly is found on the Malvern Hills, less than a mile from our house. 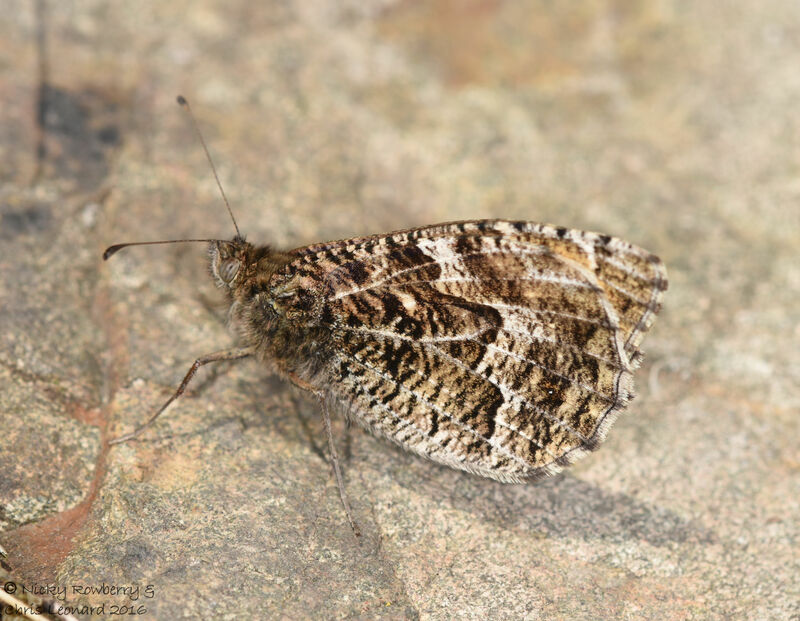 The Grayling is now a priority species for conservation as it is in decline over much of its former range. 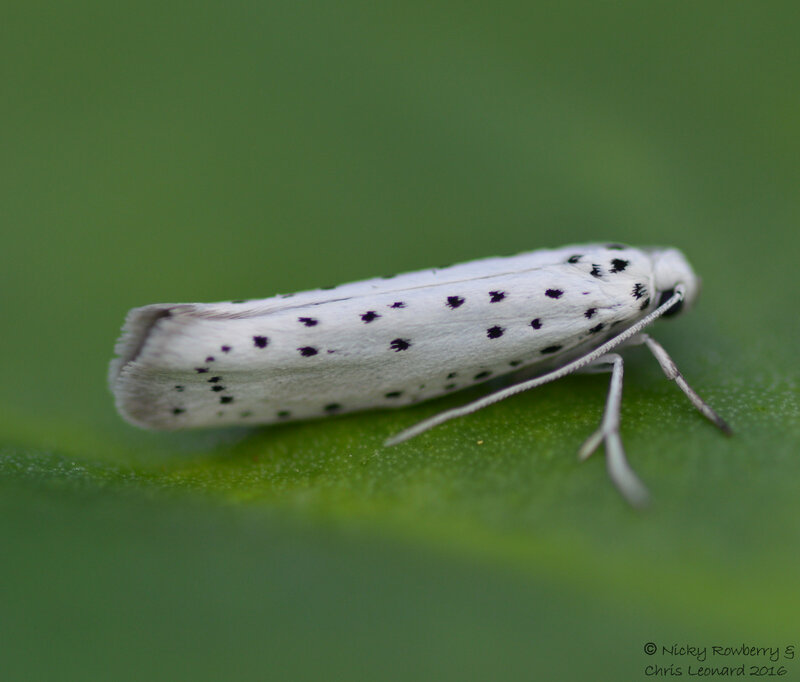 The Malvern Hills Conservators are making great efforts to protect our local population and improve the habitat. So we set off today in the hope of seeing our local speciality. 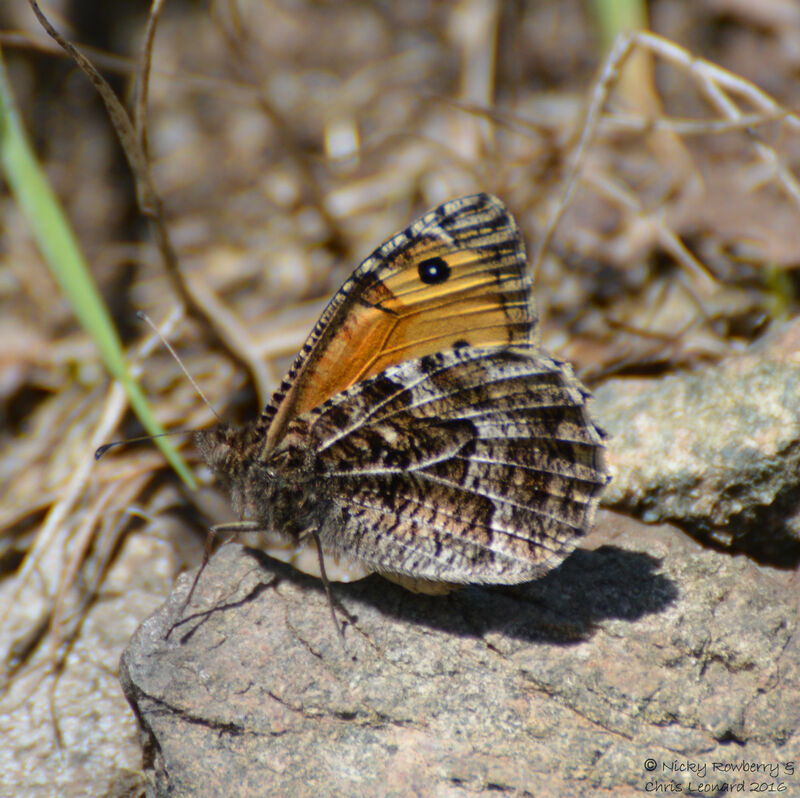 The Grayling likes areas of bare rock and short grass. 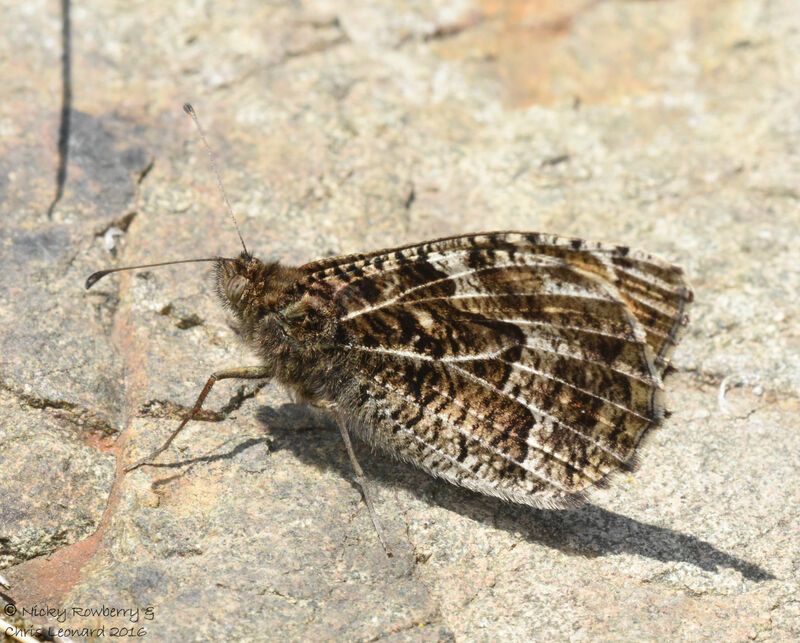 We headed up the hills following the path recommended by the West Midlands Butterfly Conservation guide and having reached the favoured location, Chris spotted one almost immediately sunbathing on the rocks. 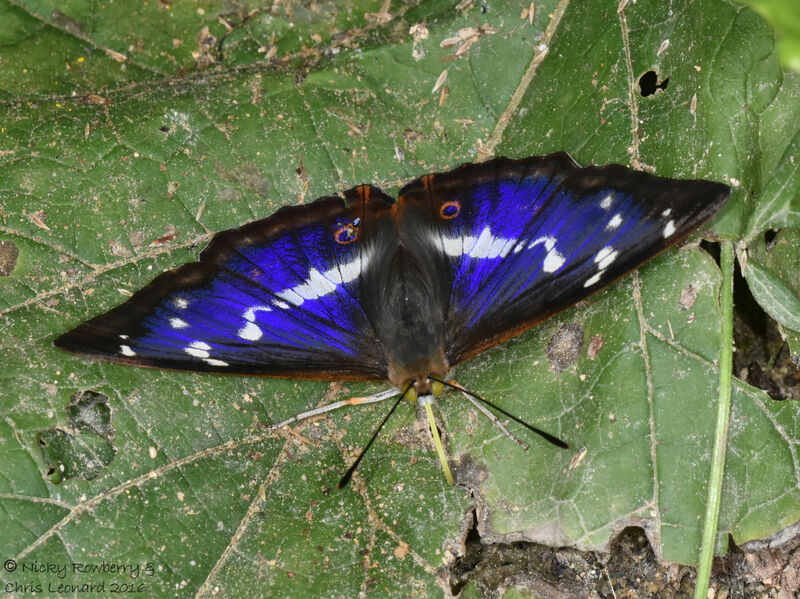 The Graylings aren’t as flashy as the Purple Emperors we saw earlier in the week, they are more subtly beautiful. They are also masters of disguise and when they keep still they blend into the surroundings extremely well. We were lucky to spot this one. Fortunately it was intent on sunbathing and was also close to the path, so we got our usual bucket-load of photos. 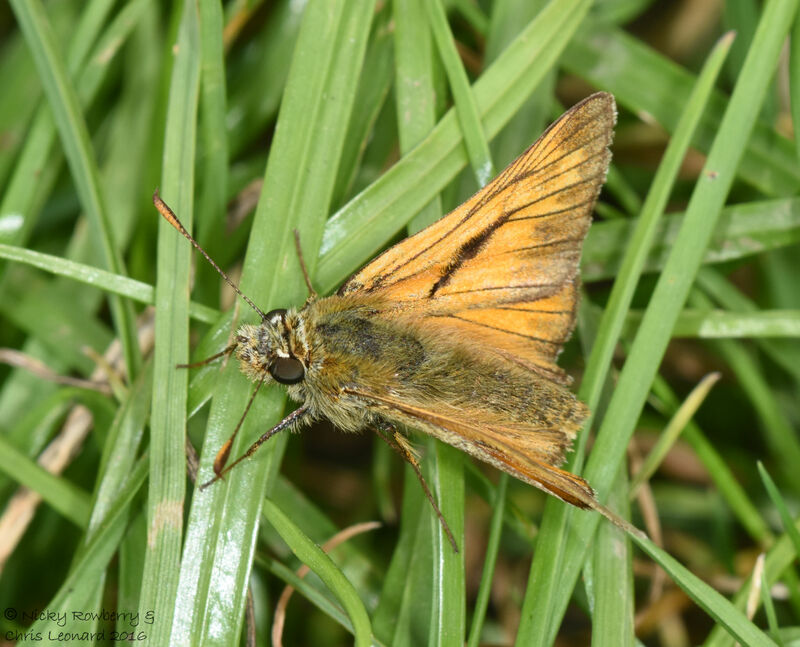 The Graylings almost always sit with their wings upright with the forewing tucked behind the hindwing, which makes them look much smaller than they really are. 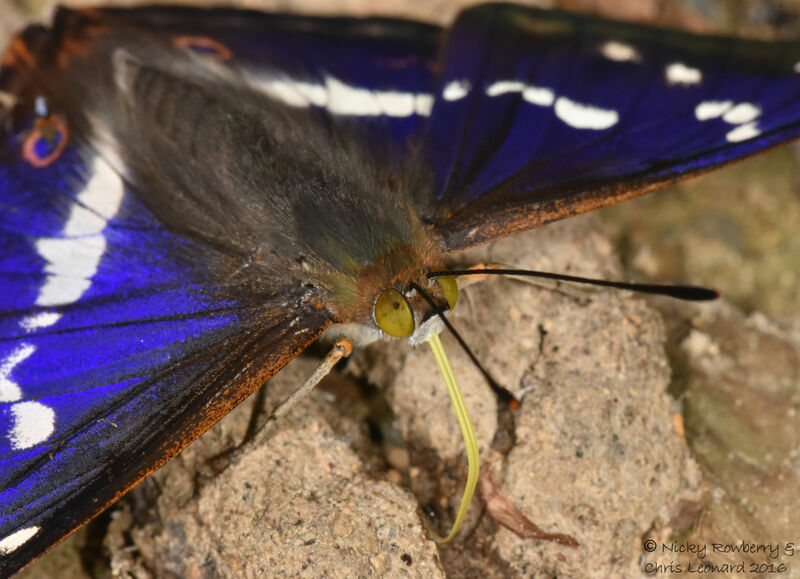 We watched this one for ages and eventually while it was shifting position, we managed to get a shot with its forewing at least partially showing. We saw at least 2 other individuals on our walk, all basking on rocks. Lots of people walked by us and the butterflies while we were there, but I don’t suppose many of them realised what they were missing! Feeling flushed with success (and also a good lunch at our local), we decided to try our luck back down on the flat ground at the edge of Malvern. 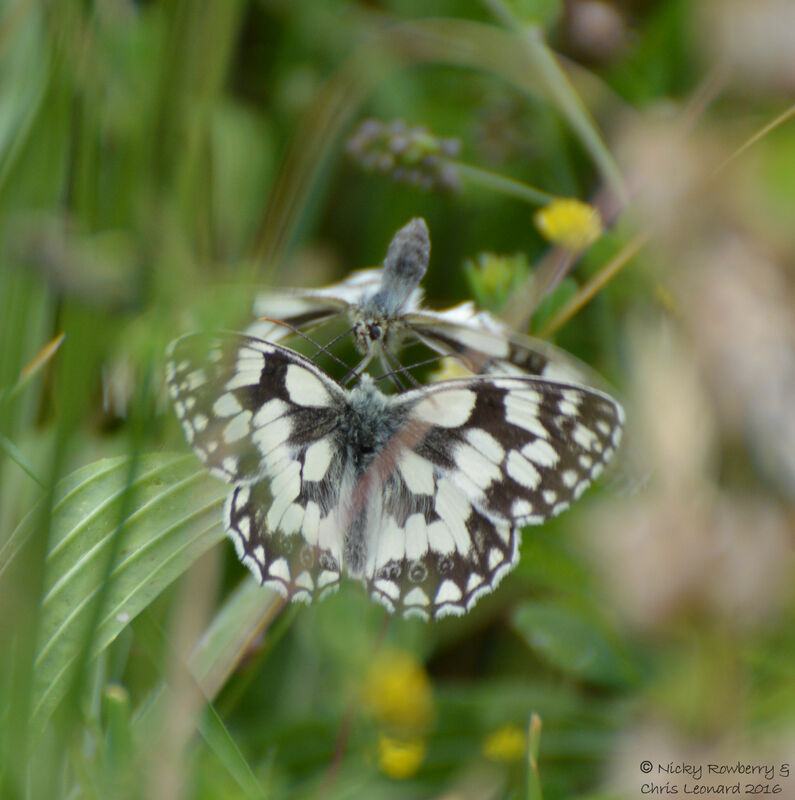 There’s an area of rough ground by the road that is always good for butterflies and today was no exception. 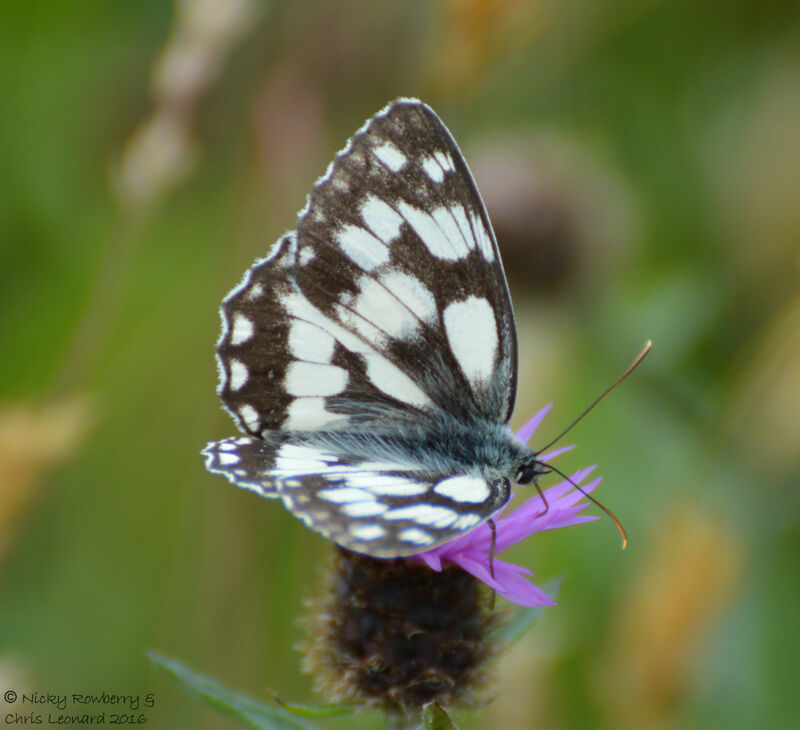 The Marbled Whites were out in force. Unfortunately it was extremely windy so although they were landing close by, the grass was blowing about so much it was hard to get decent photos. Here are a few of our better efforts. There were several pairs dancing about in the wind, so I had hoped to get a mating pair. This was the closest I managed – not ideal, but at least there are two of them in one shot! 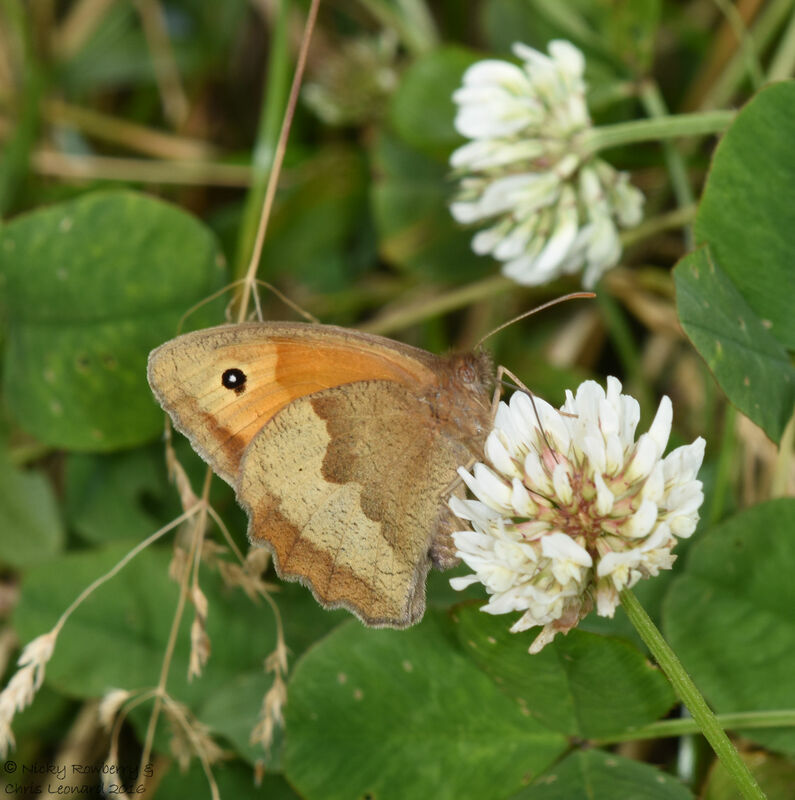 Marbled Whites weren’t the only butterflies around – Meadow Browns were particularly abundant. 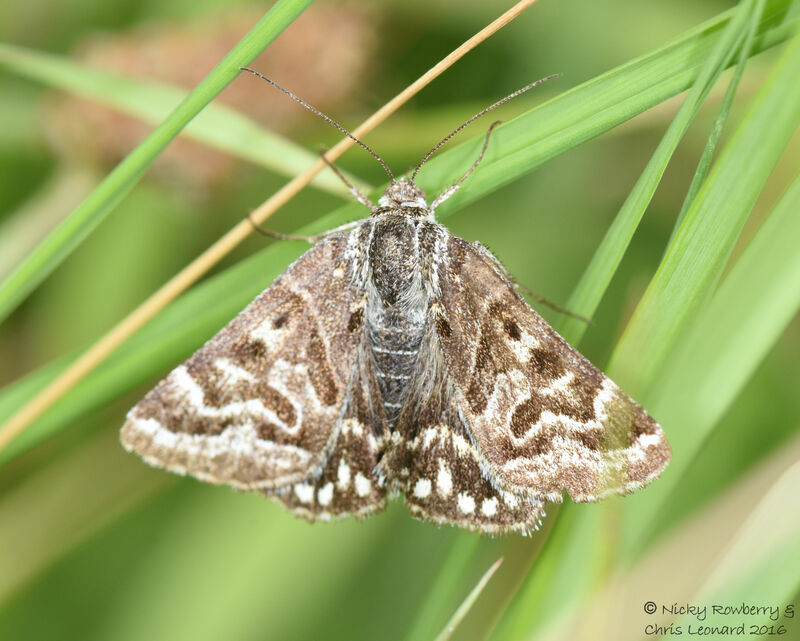 As we headed back to the car, Chris spotted this day flying moth – a Mother Shipton. Really pleased to see this, as I’m pretty sure I’ve only seen it in books before. 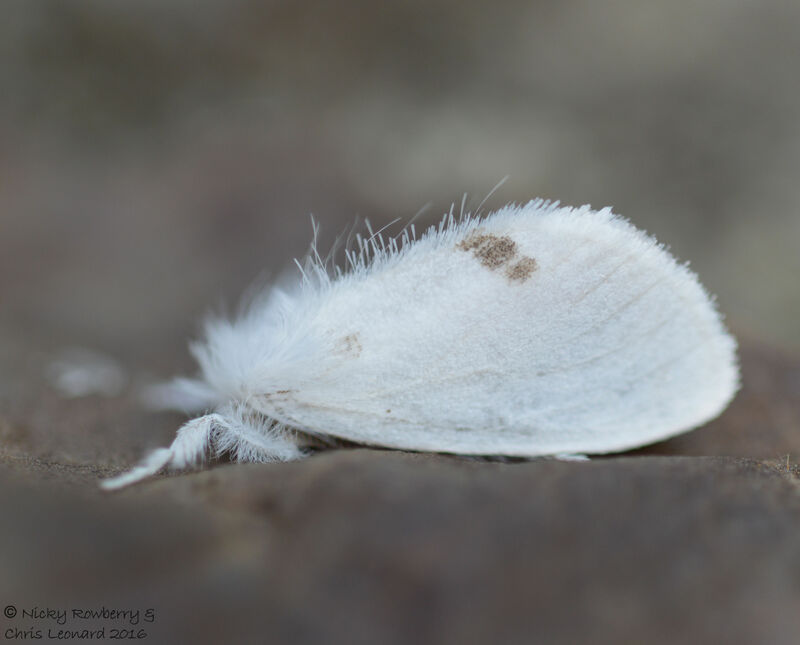 It is named after a 16th century witch because its wing markings look like an old crone with hooked nose and chin! 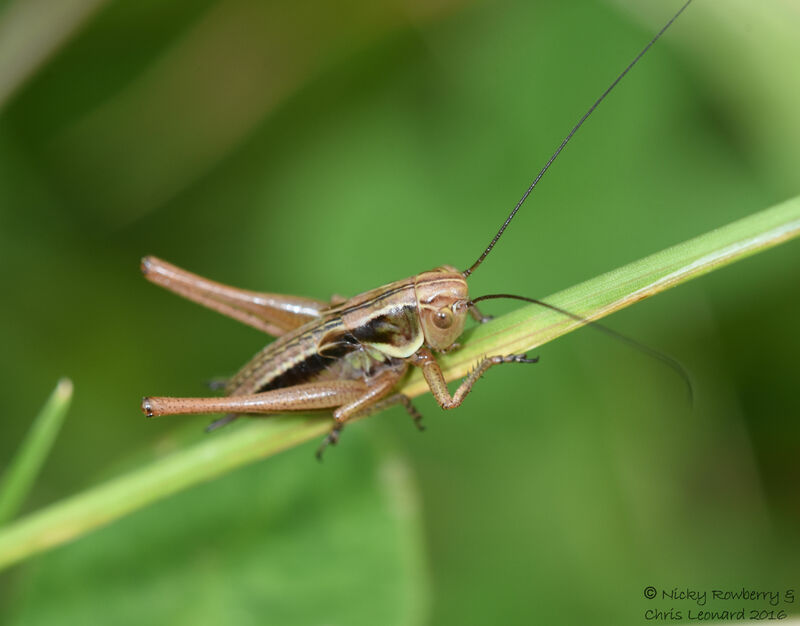 And finally a cricket. Not that this really fits in with the rest of today’s post, but it was such a nice photo it seemed a shame not to include it. And also I really like crickets! Today was all about the colour purple! 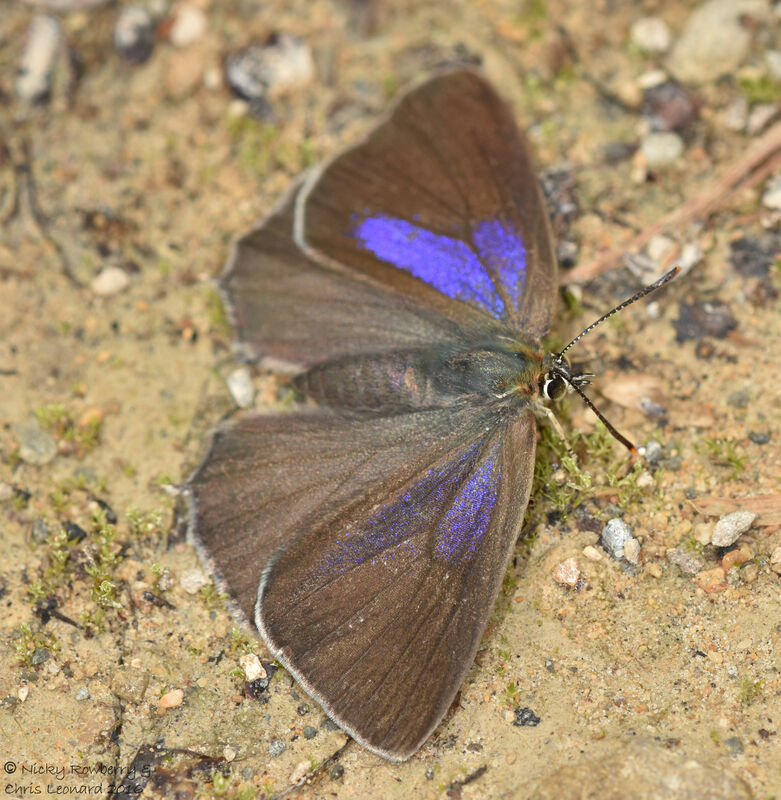 We went in search of the Purple Emperor butterfly (affectionately known as His Imperial Majesty by butterfly enthusiasts) and found not only him but Purple Hairstreaks too! 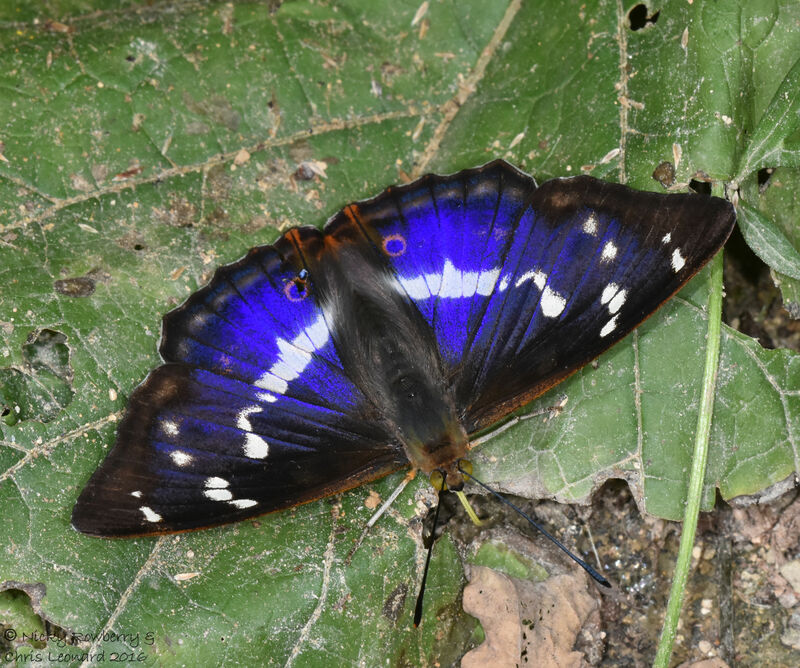 Since we first got into butterflies, the Emperor has been one of the species we’ve most wanted to see. 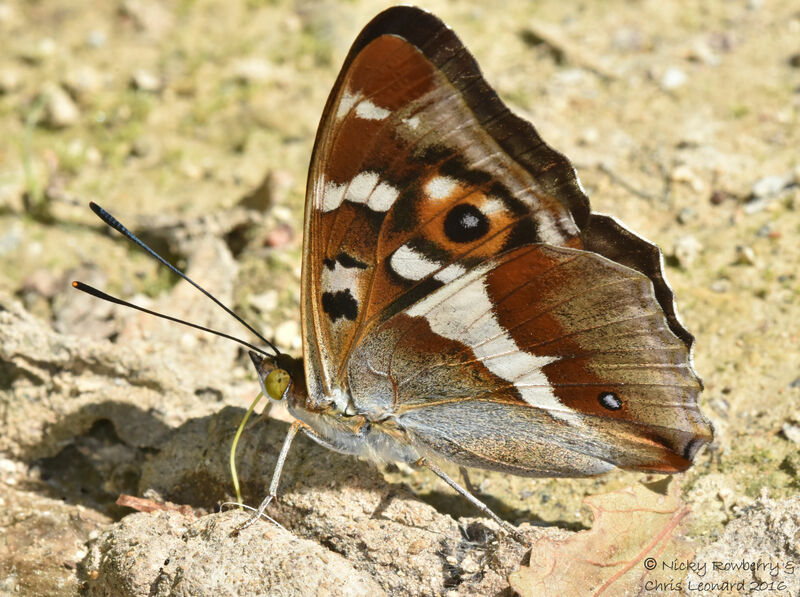 It is not only one of our largest British butterflies, but arguably one of the most beautiful. 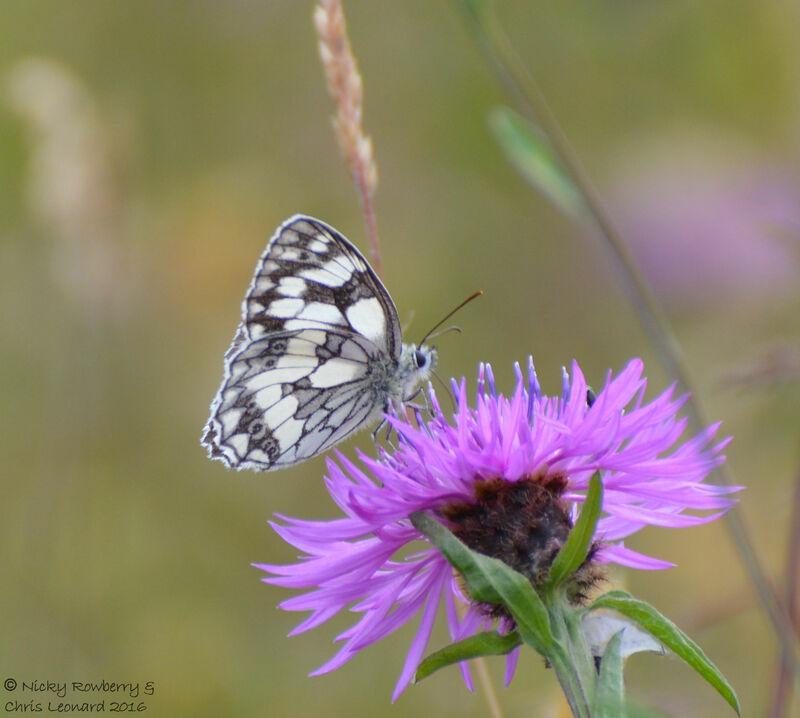 We did go looking for it last year, but sadly saw just one lonely little wing on the ground, so today we set off hoping for better and all our butterfly dreams came true. 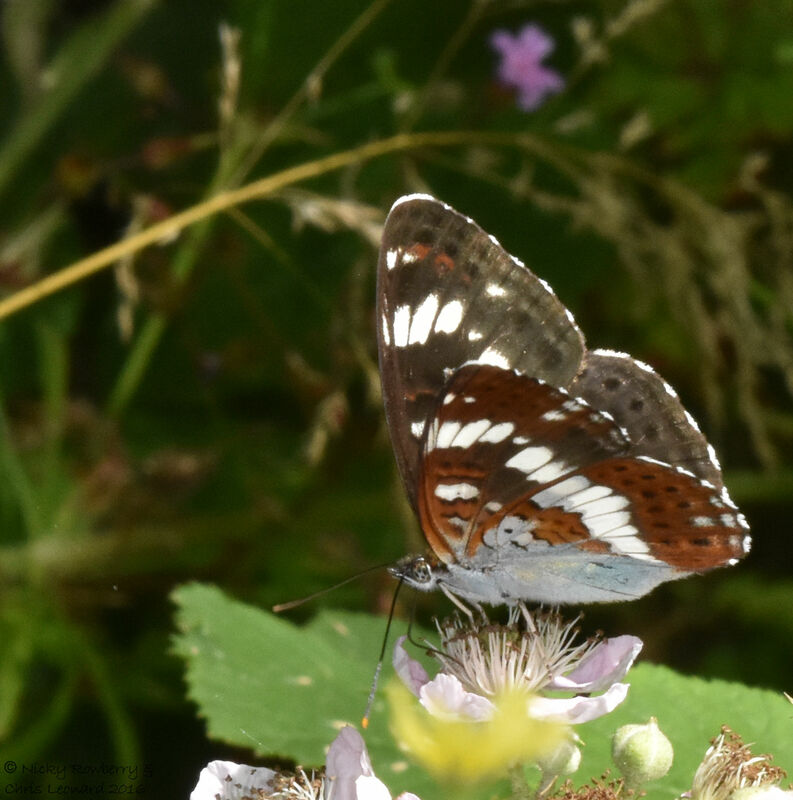 We’d seen that Butterfly Conservation Warwickshire had an organised walk at a site with Purple Emperors today, so we went along with fingers crossed. Almost immediately the walk leader announced there were a pair of Emperors up the path. 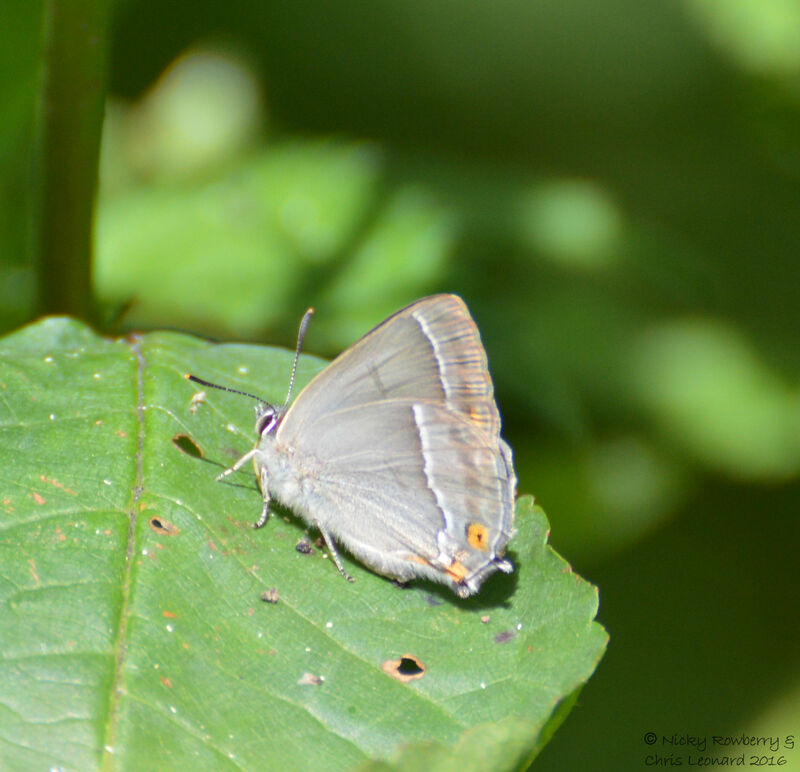 Our group charged into the wood, but as usual Chris and I got side-tracked by other species (Purple Hairstreaks and Silver-washed Fritillaries), so missed them. Our expert though soon spotted another one in a tree and we got a few distant grainy photos. Our very nice walk leader then suggested that we could either stay where we were and would likely see some Emperors or we could go with him on the official walk. Chris and I decided to take our chances and stay put. (it wasn’t just laziness, honest!) 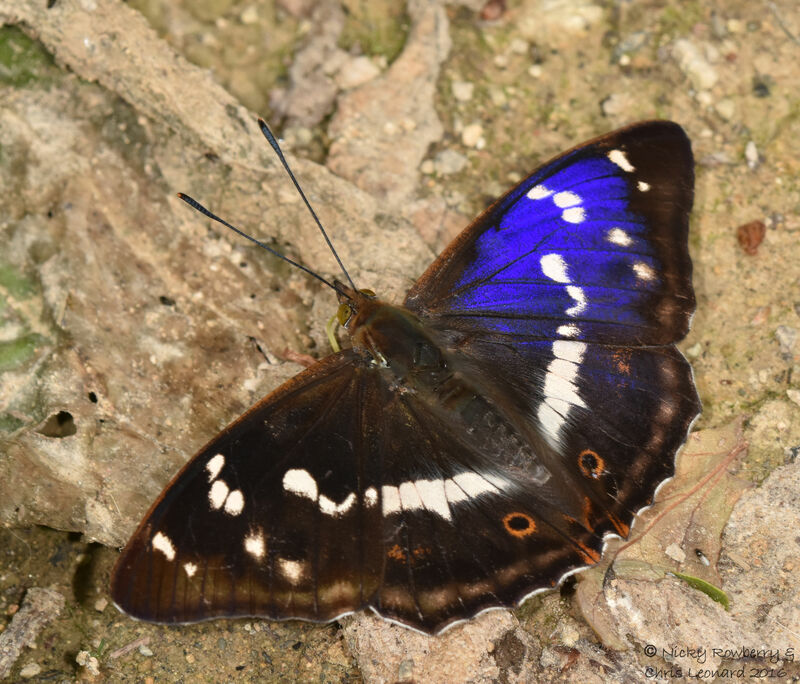 No sooner had the group disappeared over the horizon into the wood, but a Purple Emperor landed right by my feet. Once I’d managed to splutter out a shout to Chris, we then took a lot (and I mean a lot) of photos. So here are some of our best, starting with a wobbly video of His Majesty. The males come down in the mornings to gets salts and minerals from wet mud or in this case dog poo (not sounding so imperial now!) This one was so into his breakfast that he stayed for ages while we snapped away. 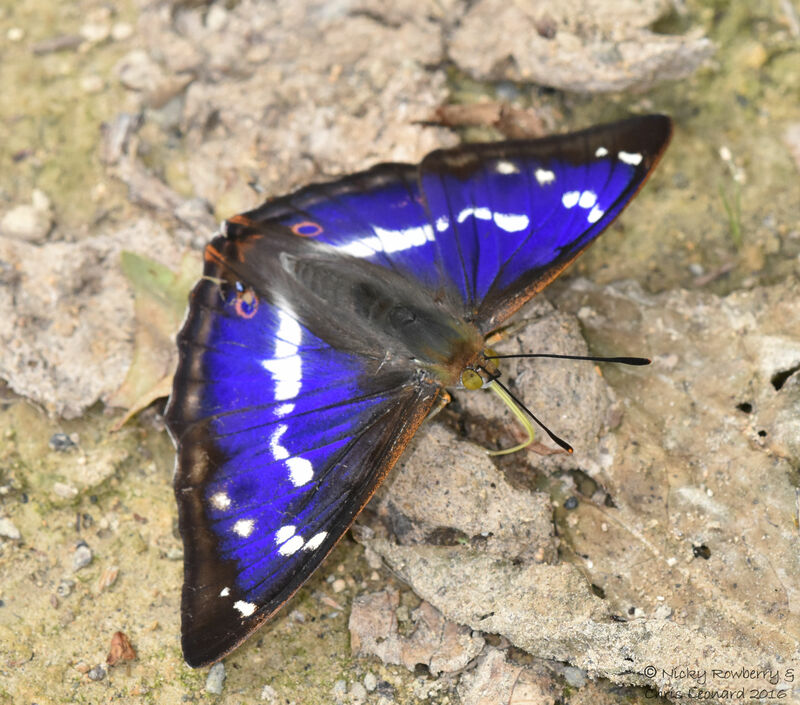 Only the males have the purple sheen to the wings and even then it depends on how the light catches them. Sometimes the wings look almost black, other times just one wing glows blue and just occasionally when the angle is right both wings shine gloriously. 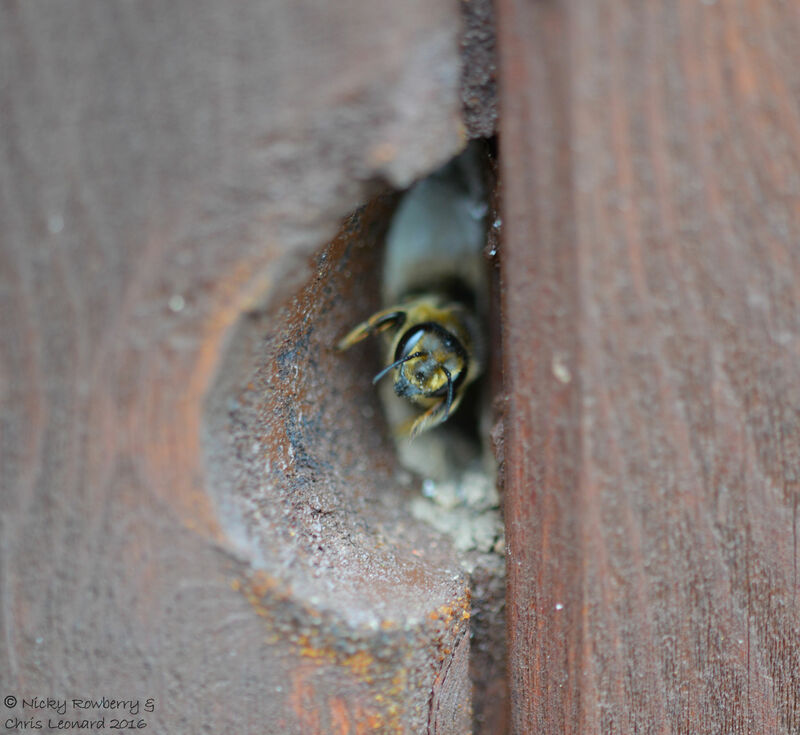 In these last 2 photos you can really see him sticking his proboscis into the dried up poo – each to their own! 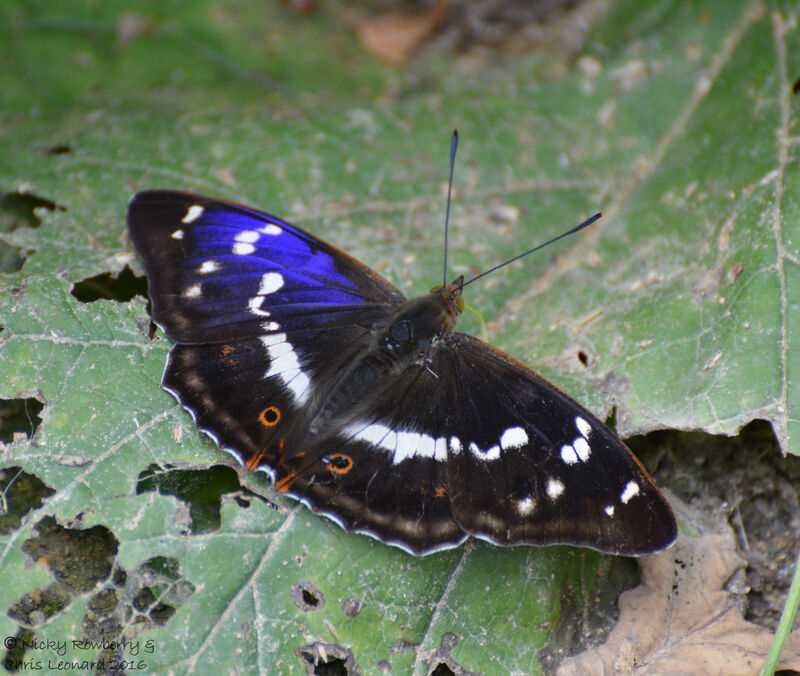 There is probably only one thing better than seeing a Purple Emperor – seeing two! 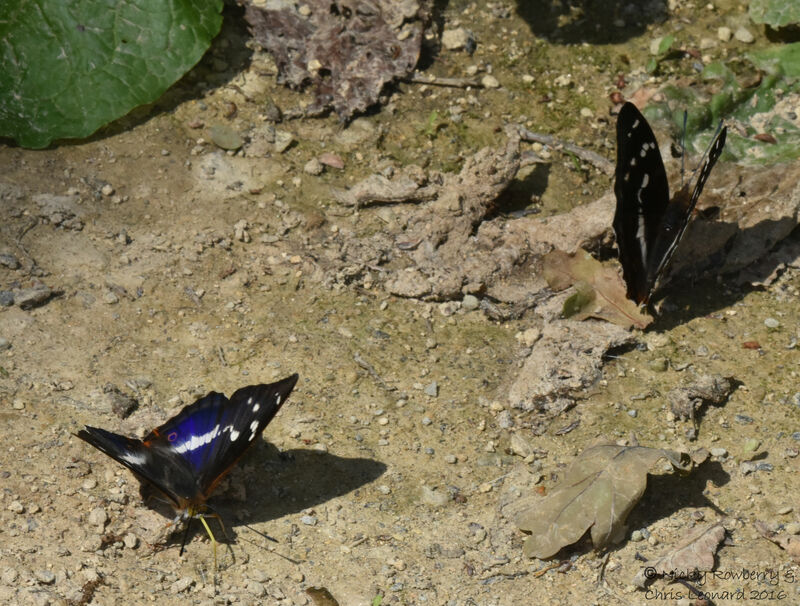 Unfortunately I had wandered off chasing another butterfly, but Chris managed to get two together. 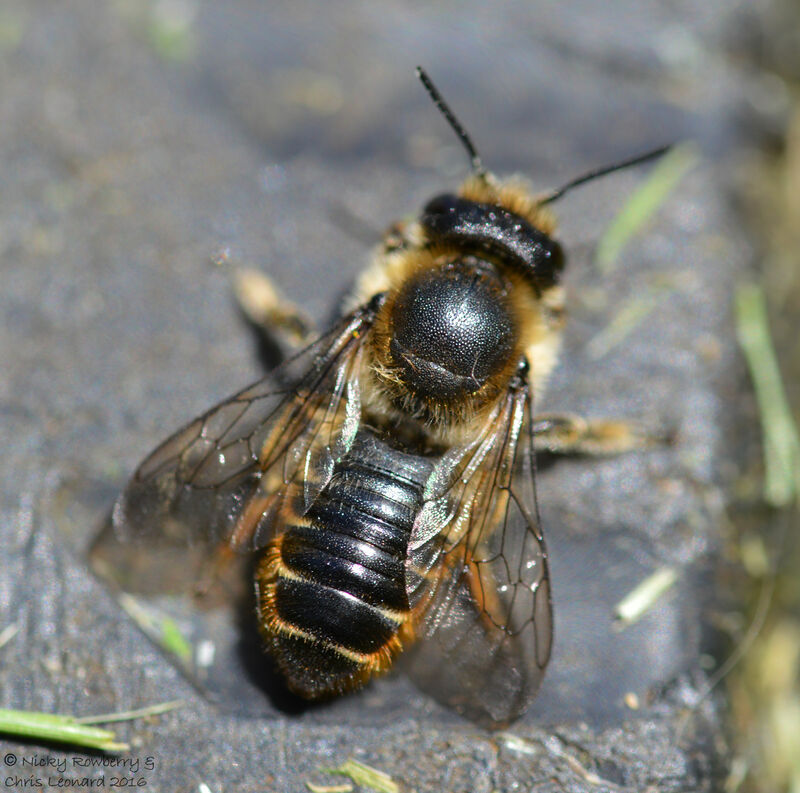 Not great photos as the second one didn’t hang around – probably flew off in search of a dog poo of his own. 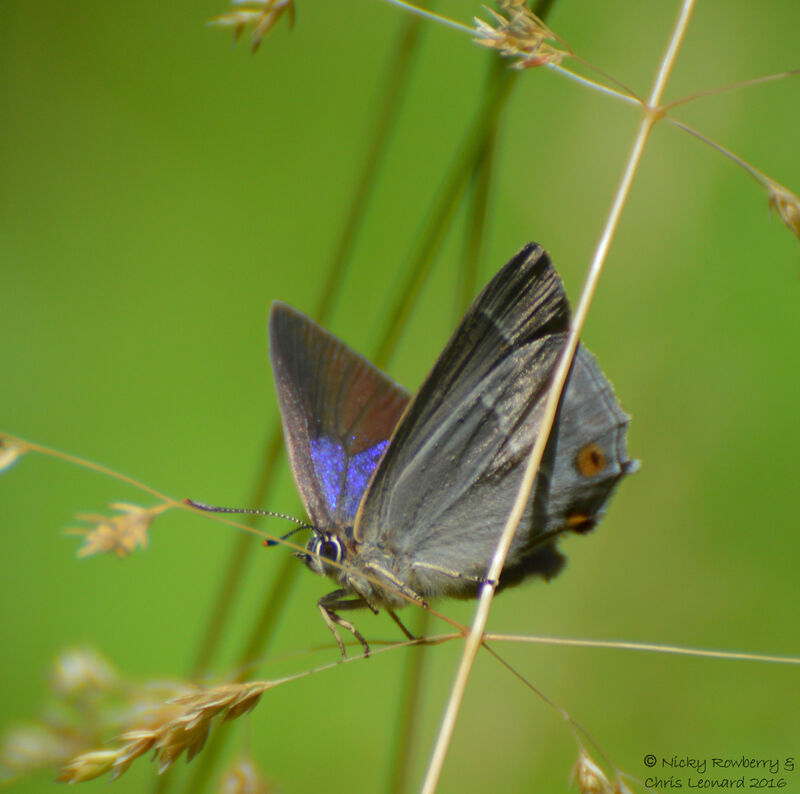 We’d spotted a Purple Hairstreak as we first entered the wood and got a few typical shots of it with its wings vertical. 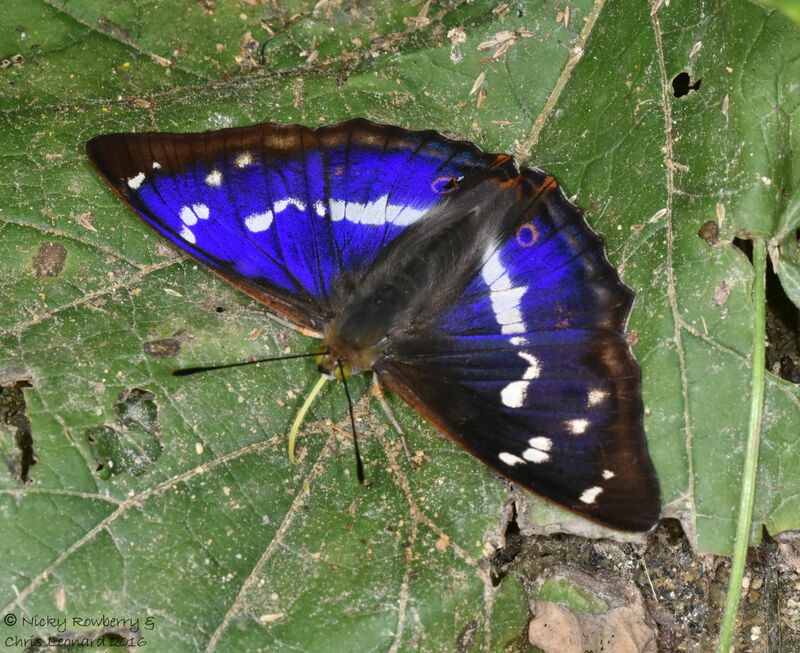 This is a very small butterfly compared to the Emperor and spends most of its time up in the trees, so is easy to miss. On the way back to the car, we spotted another one. We were delighted when it opened its wings and then even better settled on the ground allowing us to snap away. 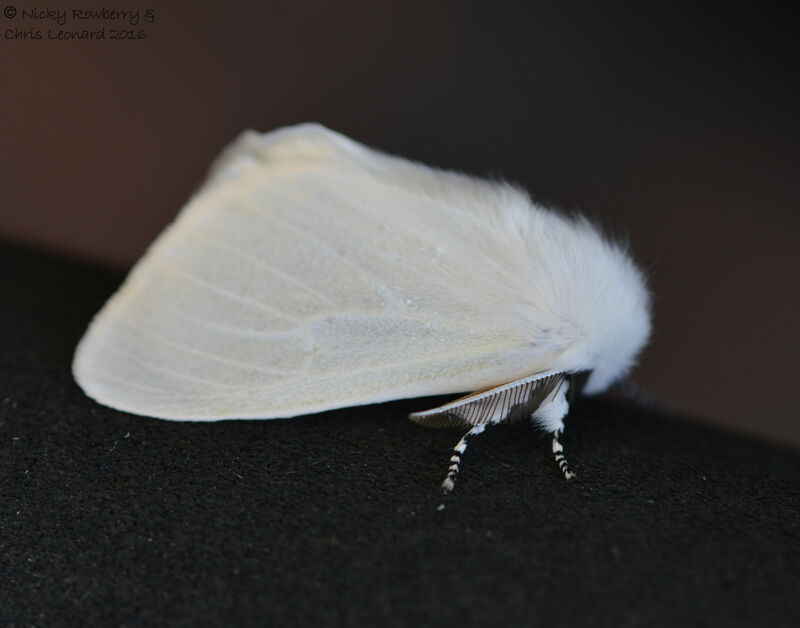 We’ve never seen these with their wings open before, so this was a real treat. 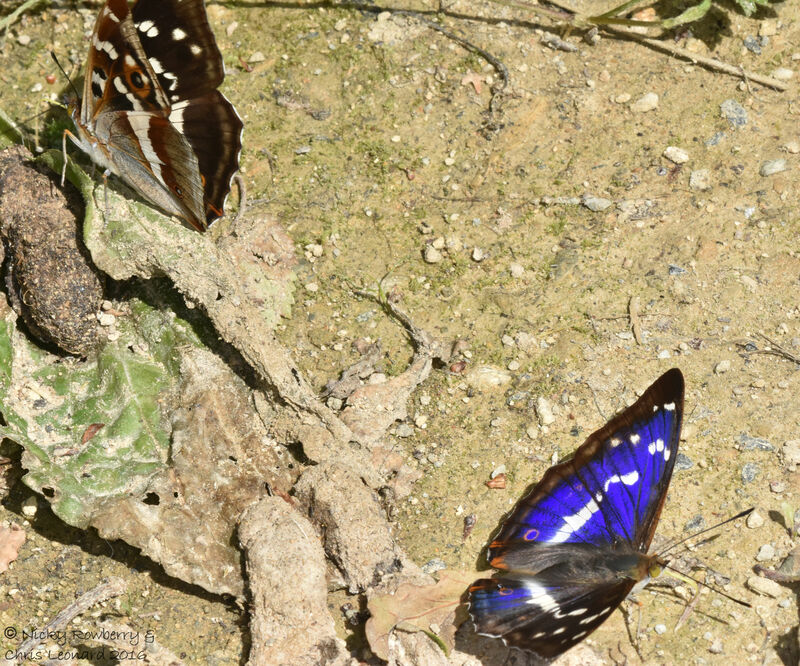 But all these purple beauties weren’t the only butterflies around today. 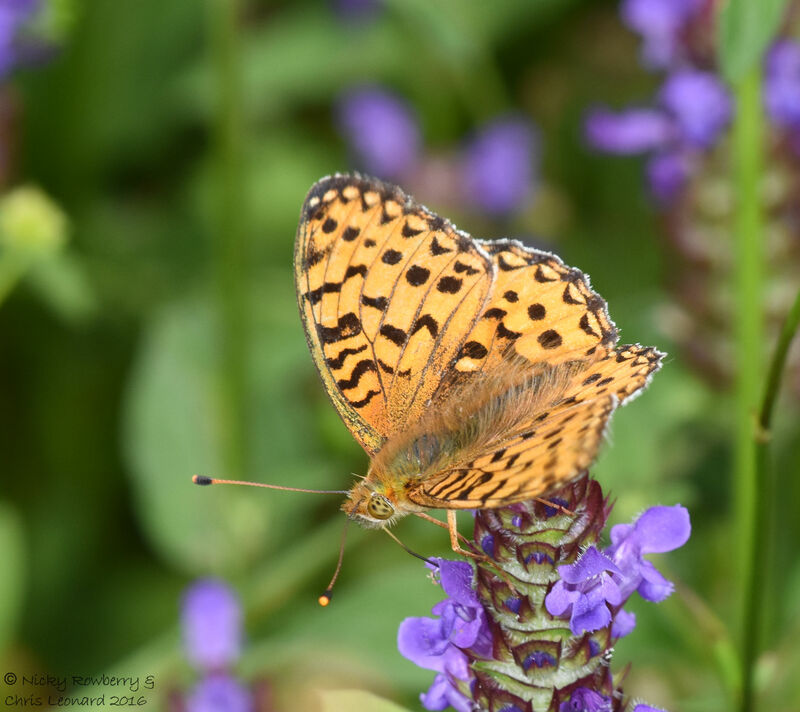 We saw lots of Silver-washed Fritillaries, most of which were bombing about way too fast to get a photo, but one or two did settle long enough. 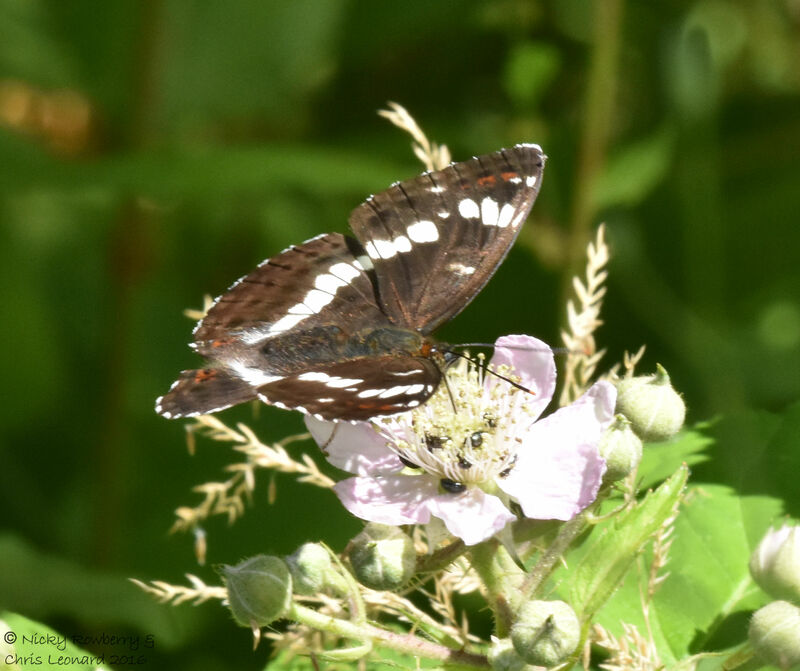 Just before we’d spotted our Purple Emperor we saw this White Admiral. We got all excited thinking it was the Emperor as they are pretty similar, although obviously lacking the purple sheen. Brambles must be the Admiral’s favourite flower, as we often see them on these. 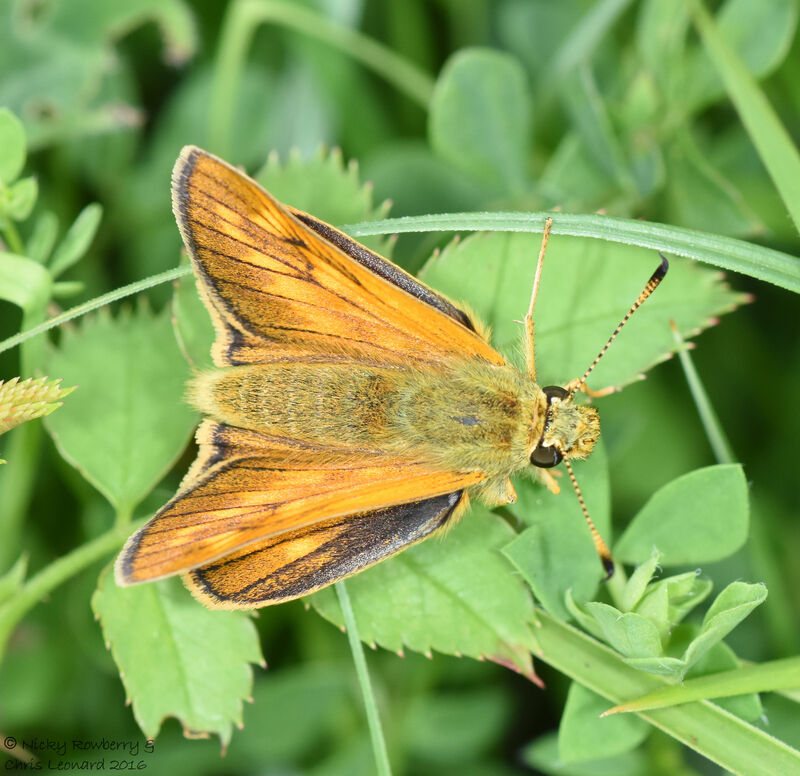 Also spotted today were lots of Ringlets, Speckled Woods, some kind of very fast and consequently unidentified white and last but not least several of these Large Skippers. 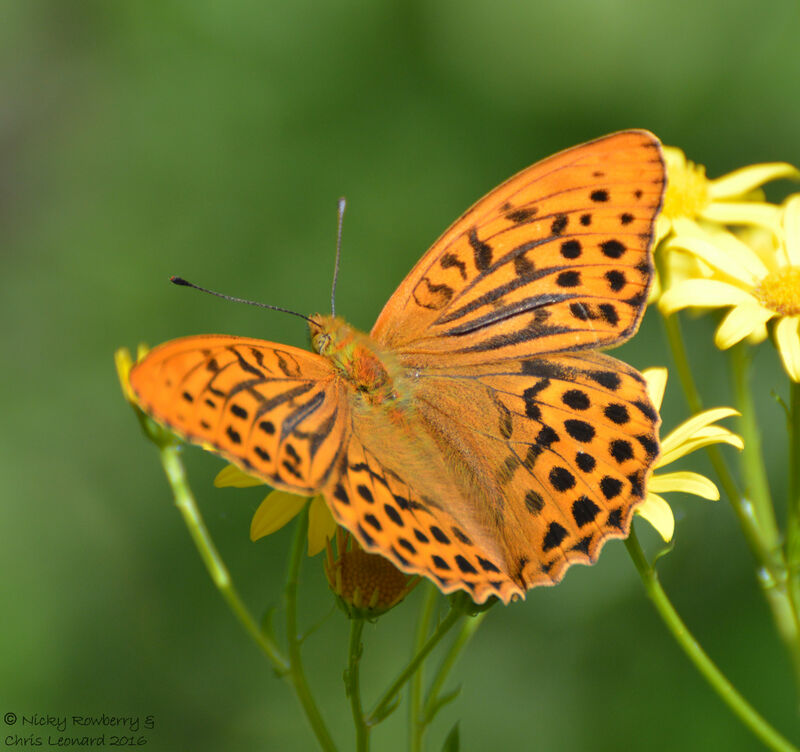 I think today will go down as one of our most successful butterfly walks ever! 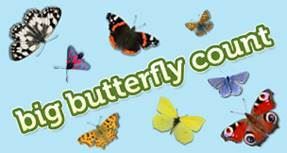 Thank you Butterfly Conservation Warwickshire for organising the walk and making our Imperial dreams come true!